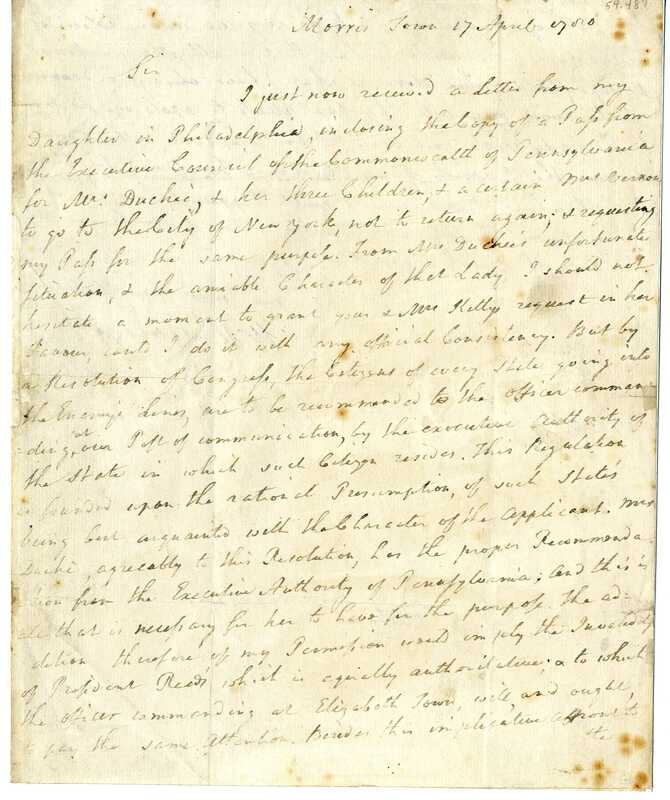 Beginning in May 1787, 55 delegates from 12 states met at the Constitutional Convention in Philadelphia to discuss improvements to the Articles of Confederation. 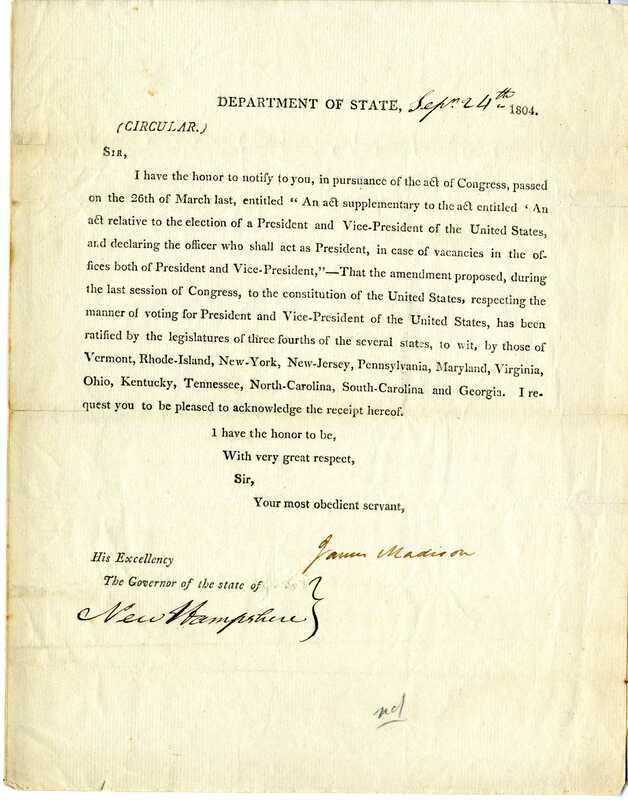 Concluding instead that the creation of a new system was preferable to repairing the current one, the delegates created a new American government. They made decisions and agreed to compromises regarding issues as serious as how to elect a president, how the people could be fairly represented in Congress, and how slaves would factor into the population. All of this was accomplished in little more than 100 days. On September 17, 1787, 39 delegates signed the United States Constitution and sent it to the states for ratification. The drafting of the U.S. Constitution is still one of the most remarkable achievements in human history. 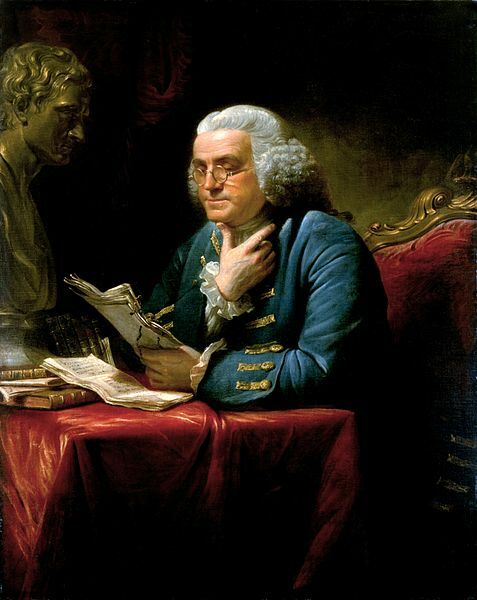 Pennsylvania delegate Benjamin Franklin, while only cautiously optimistic, remarked as the document was completed and readied for signing that he was astonished “to find this system approaching so near to perfection as it does.” History confirms Franklin’s opinion. At fewer than 5,000 words and rarely amended, the Constitution continues to stand the test of time. This exhibit includes brief essays regarding each of the 12 states and the delegates who represented them. The states appear here in the order in which they ratified the Constitution. Rhode Island did not participate in the Constitutional Convention. The Americana Collection houses a complete set of documents that includes the signatures of the 39 signers of the Constitution. All 39 signers are represented in this display. When the Constitution failed to include provisions for the smaller states, the Delaware delegation threatened to walk out. George Read took an unpopular stance. He proposed abolishing the individual state governments and having one central government. The idea was so aggressive, even his fellow delegates could not support his position, although they shared the fear of the smaller states not having equal representation and the larger states becoming more powerful. George Read was an attorney and respected politician from New Castle, Delaware. He served as an attorney general under the British crown before opposing the Stamp Act in 1765. He went on to serve in the colonial legislature. He was the only signer of the Declaration of Independence to cast a vote against it. Today, many believe Read voted against the Declaration because he truly wanted to resolve issues with Britain. Given George Read’s opinionated background, his strong presentation for protection of the smaller states at the Constitutional Convention was not surprising. Gunning Bedford, Jr., also a lawyer, transitioned into politics not long after the American Revolution. He was serving as Attorney General for Delaware when called to serve in the delegation to the Convention. Like George Read, Bedford stirred controversy when he alluded to the smaller states seeking allegiance with other countries if the Constitution failed to protect them. 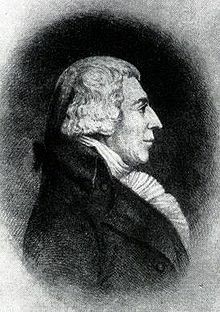 Bedford maintained a strong opinion regarding equal representation of the smaller states as well as limitations to the powers of the central government. He also had a keen skill for negotiation and sat on the committee that developed the Great Compromise. John Dickinson began his political career in Pennsylvania. He practiced law before serving in the Pennsylvania assembly. In opposition to the Stamp Act, Dickinson authored several documents speaking out against unjust taxation. Although Dickinson resented the crown, he remained hopeful for a peaceful resolution. 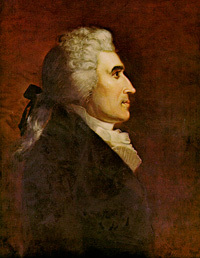 Dickinson voted against and refused to sign the Declaration of Independence. He retired to Delaware but later returned to politics, signing the Articles of Confederation and later accepting an appointment to the Convention. He supported a strong central government and resented the power asserted by the nationalists. Dickinson served on the committee that developed the Great Compromise. Due to illness, Dickinson missed several sessions and was unable to sign the Constitution himself. He authorized George Read to sign on his behalf. Richard Bassett and Jacob Broom both played minor roles in the Delaware Delegation. Neither served on any committees nor spoke very often at the Convention. However, both were supportive of the opinions of their more established and respected colleagues: Read, Bedford, and Dickinson. Bassett was trained as a lawyer and planter. He served as Captain of a Dover militia troop during the Revolution. Broom’s background was as a planter, surveyor, and merchant. He also served as an assistant burgess and, later, chief burgess prior to serving at the Constitutional Convention. Once the final draft of the Constitution included equal provisions for the smaller states, the Delaware Convention unanimously voted 30-0 to ratify. Delaware became the first state to ratify on December 7, 1787. The Delaware delegation successfully argued the need to have proportional representation of the states. Bedford and Dickinson, supporters of the New Jersey plan, are credited with negotiating the interests of the less populous states while developing the Connecticut Compromise. 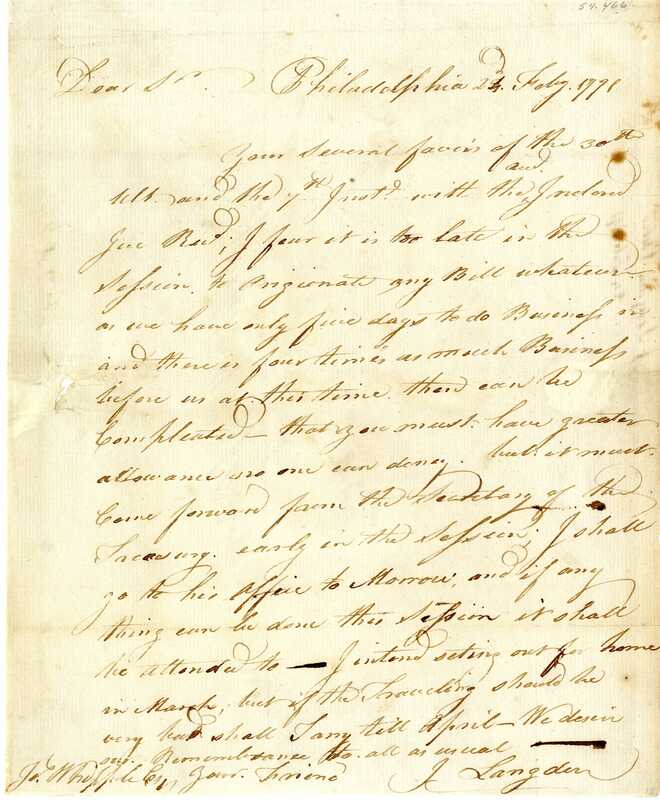 Letter from George Read to Eleazar McComb, Delaware state auditor of accounts, requesting him to record a payment authorized by the President of the Delaware General Assembly, 1787. 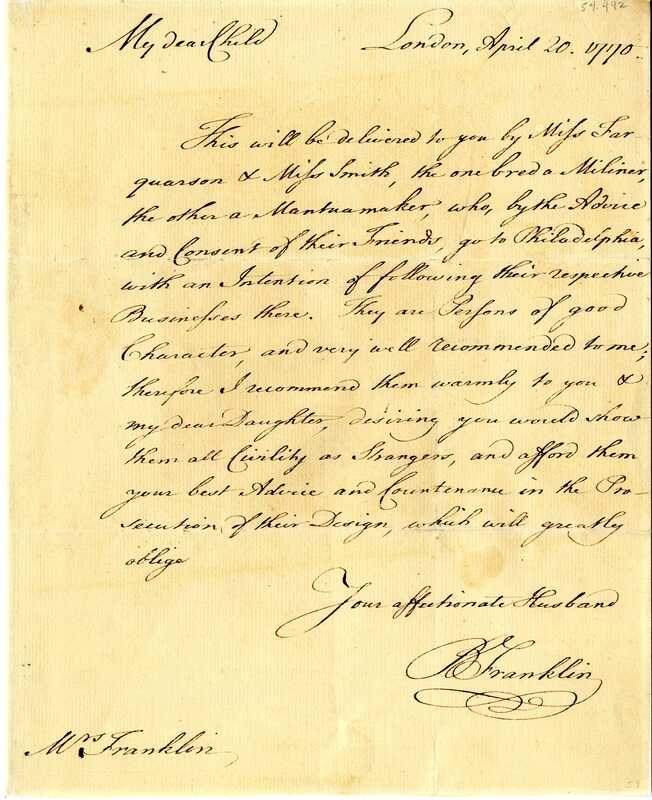 Letter from Gunning Bedford to Colonel Mooney. Gunning Bedford’s signature is featured on this intelligence letter. 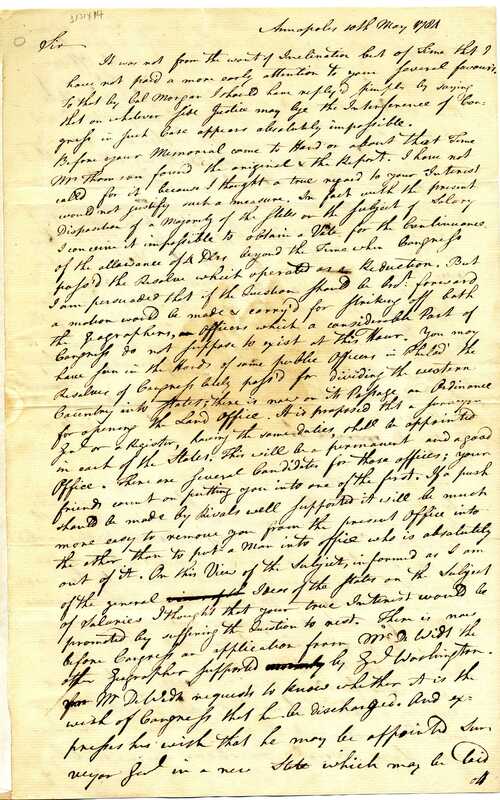 Bedford shares with Col. Mooney information gathered from Tories in New York and Pennsylvania during the American Revolution, 1782. 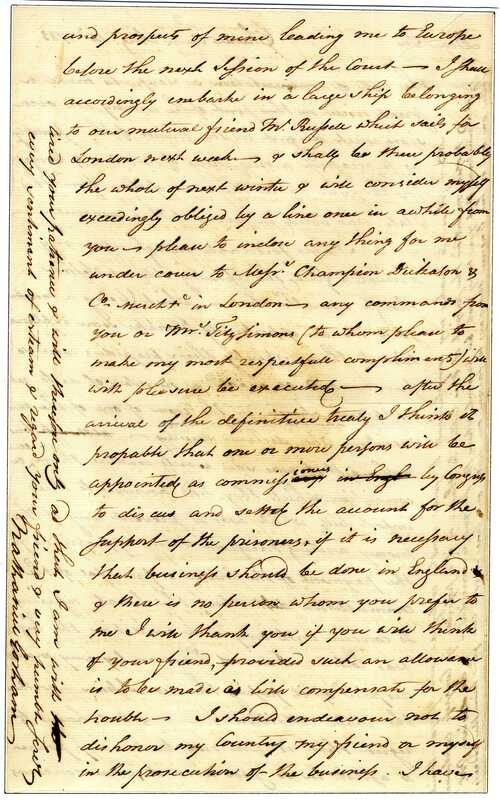 Letter from John Dickinson to George Read. 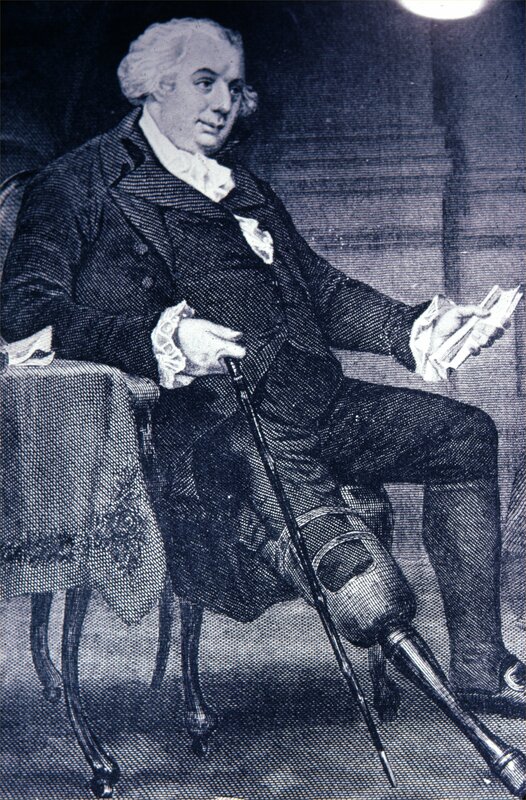 Due to illness, John Dickinson missed several sessions and was unable to sign the Constitution himself. He authorized fellow delegate and friend George Read to sign on his behalf. 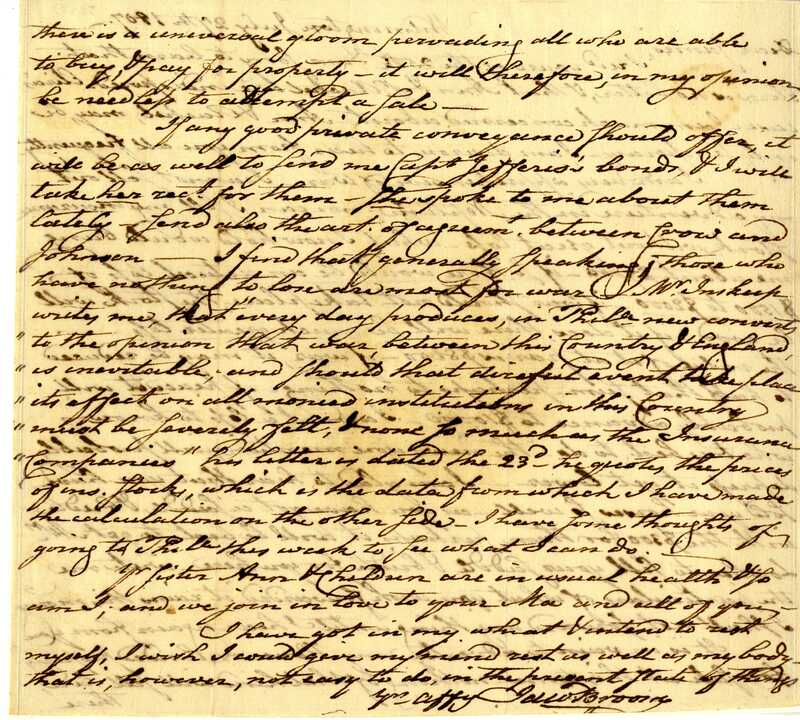 His actual signature appears in this personal letter coincidently from Dickinson to Read, 1782. 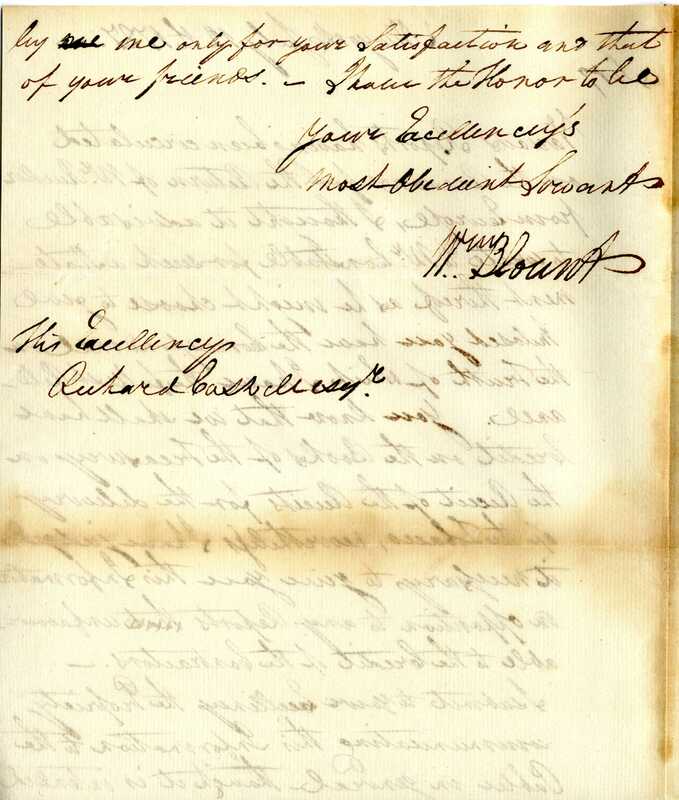 Letter from Richard Bassett to Caesar Rodney, no date. 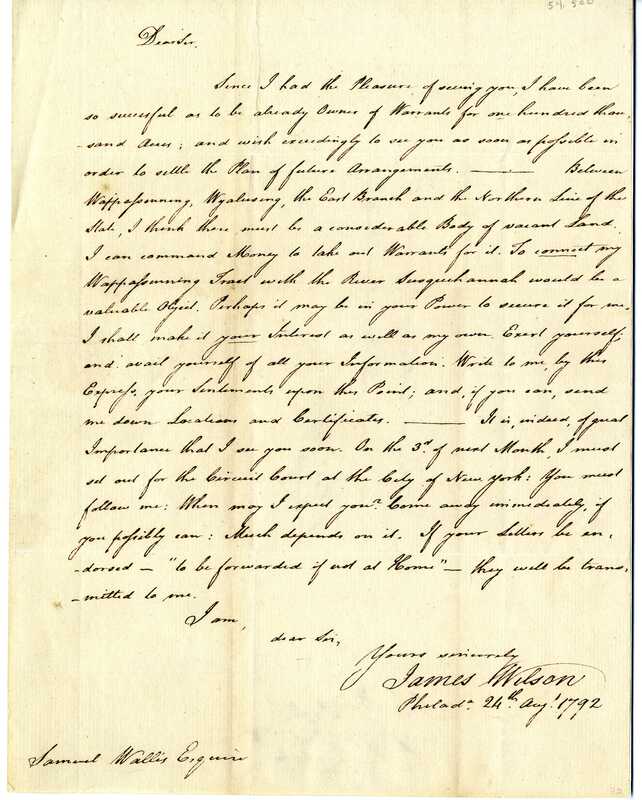 Letter from Jacob Broom to his son, James Broom, concerning health, finances, and a possible war with Great Britain, 1807. Pennsylvania became the focus of national attention by holding the Constitutional Convention in Philadelphia from May 25 to September 17, 1787. Philadelphia was not only the largest American city, but also it was in many ways the cultural, financial, intellectual, and social center of the nation. Pennsylvanians believed that they had shouldered too great a share of the federal debt, and consequently there was hope that a new national government might relieve the burden. 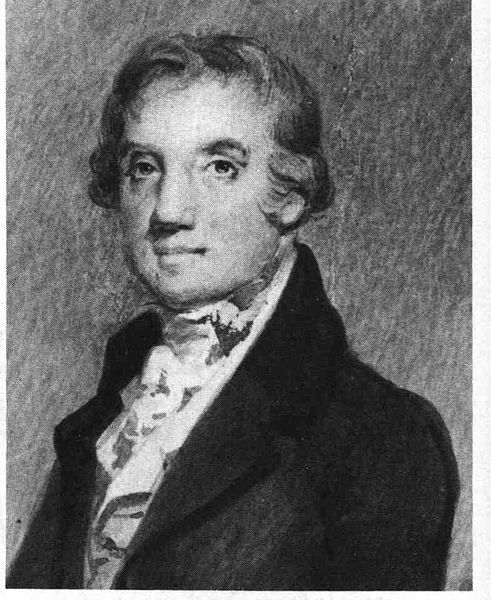 The most important contributions to the Convention from Pennsylvania came from James Wilson and Gouverneur Morris, both of whom made more speeches than the other delegates. Gouverneur Morris was there at the very start, but then was called away to New York for a month. Despite his absence, he made 173 speeches – more than any other delegate. At the Convention, Morris was among the large-state nationalists who favored the Virginia Plan, and he believed that taxes should be paid in proportion to a state’s population. He did not want the president to be chosen by Congress, but rather by citizens. He was also one of the most frequent and forceful voices against slavery. Morris’s greatest contribution to the Convention was his principal role, as a member of the Committee on Style, in rephrasing the Constitution into what we know today. The most often quoted words from the preamble to the Constitution are attributed to Gouverneur Morris. James Madison may be credited as the father of the Constitution, but James Wilson is often recognized as the number two man. Not only was he one of the top speakers at the Convention with 168 recorded remarks, but also he put forth an idea that is still the basis of American government. It was Wilson who proposed that a system of checks and balances be required to ensure that the power vested in leaders could not be abused. Wilson defended the idea of having one person as the chief executive when other delegates insisted that such a practice would lead to the creation of a virtual monarchy. He insisted that the president should be elected by the American people and not by the legislature, as some had suggested. The organizers of the Convention knew that Benjamin Franklin’s presence would lend the debates an air of respectability. At 81 years old, he often propped up his gout swollen feet and napped through the deliberations. When he was too tired to speak, he passed notes to his friend, James Wilson, who read them aloud in his distinctive Scottish accent. It’s not clear that Franklin contributed any great ideas toward the creation of the Constitution. What we do know is that he told humorous stories and parables, which lightened the mood. Franklin supported a unicameral, or single-house, legislature, and either a weak president or a council of men to act together as chief executive. He disliked the idea of entrusting a single person with so much power and he was against paying politicians for their services. Thomas FitzSimons didn’t speak much, but there was little doubt about his position. He was a strong nationalist who fell in line with the other businessmen supporting large-state interests. FitzSimons also wanted government to regulate trade and commerce. George Clymer, Jared Ingersoll, Thomas Mifflin, and Robert Morris attended the Convention and rarely missed any of the meetings. Although they hardly said a word, they all effectively played modest roles in shaping the final document. 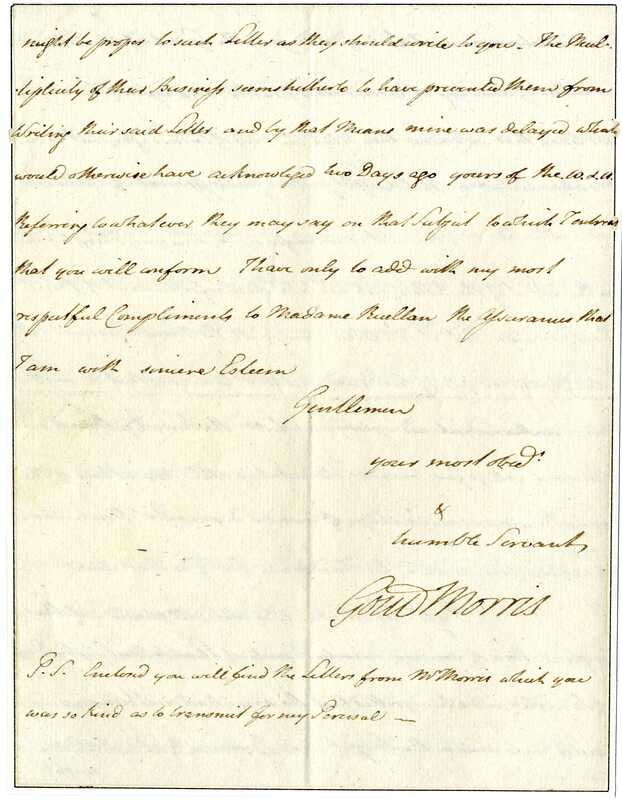 Letter from Gouverneur Morris to Messrs. Ruellan and Company of Le Havre, France, consulting a delivery of American goods, 1789. 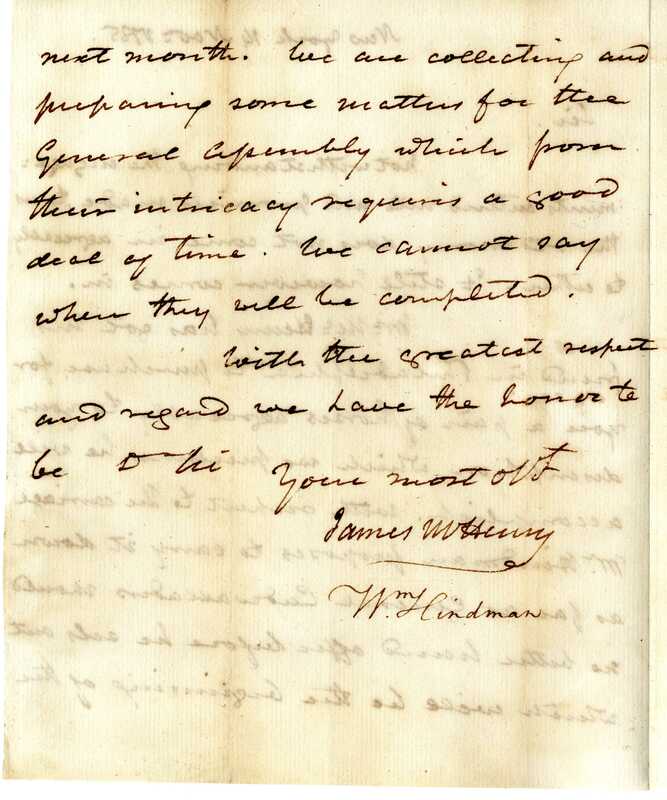 Letter from James Wilson to Samuel Wallis, a surveyor and assessor, regarding an opportunity to purchase land to connect the Wappassening tract to the Susquehanna River, 1792. Letter from Benjamin Franklin to Mrs. Franklin introducing Miss Farquarson and Miss Smith, a milliner and a mantuamaker, 1770. 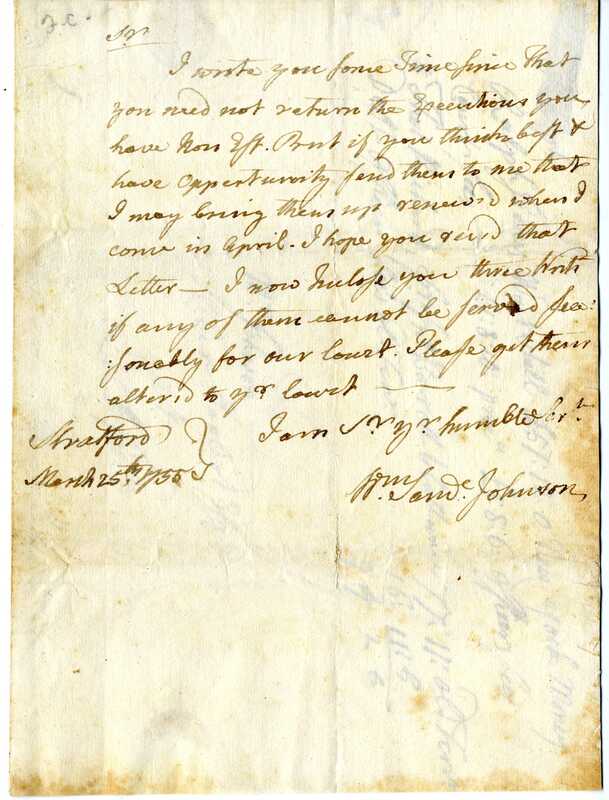 Letter from Thomas FitzSimons to Nicholas Low, Director of the Bank of New York, offering financial advice concerning a mutual friend, 1786. 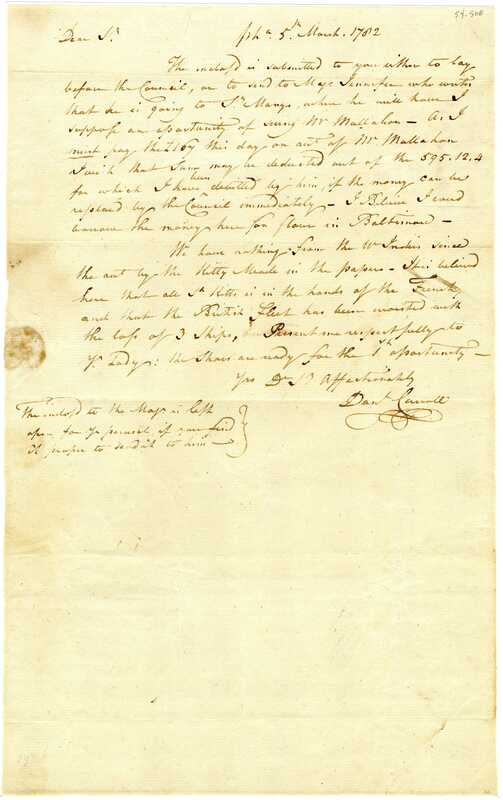 Letter from George Clymer to Ebenezer Bowman, an attorney of Luzerne County, Pennsylvania, regarding the tax on land in Luzerne County, 1801. 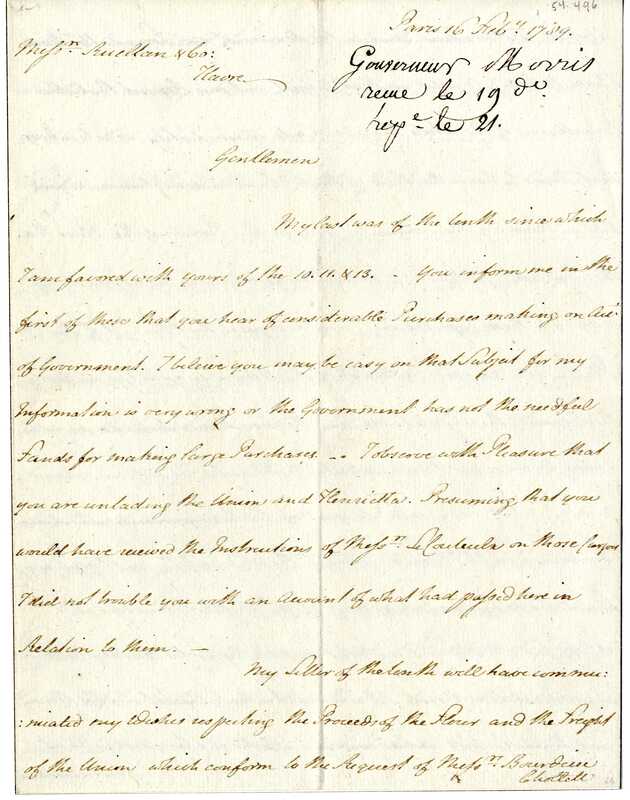 Letter from Jared Ingersoll to George Bryan, Auditor General of Pennsylvania, inquiring on the status of the Commonwealth against Mr. Dallas from the Offices of the Prothonotaries of the Supreme and District Courts, 1815. 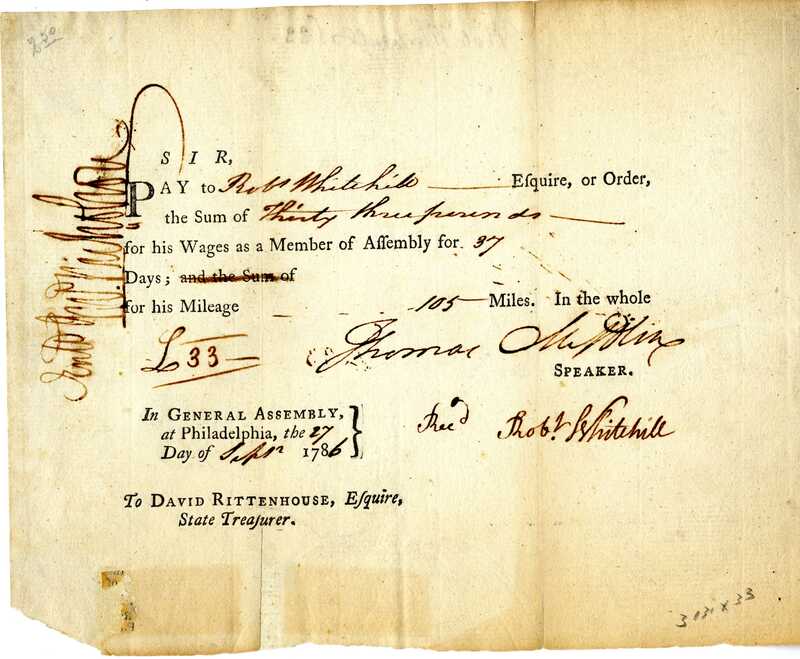 Order to pay Robert Whitehill for his wages as a member of the Pennsylvania General Assembly, signed by Thomas Mifflin as Speaker of the Assembly, 1786. 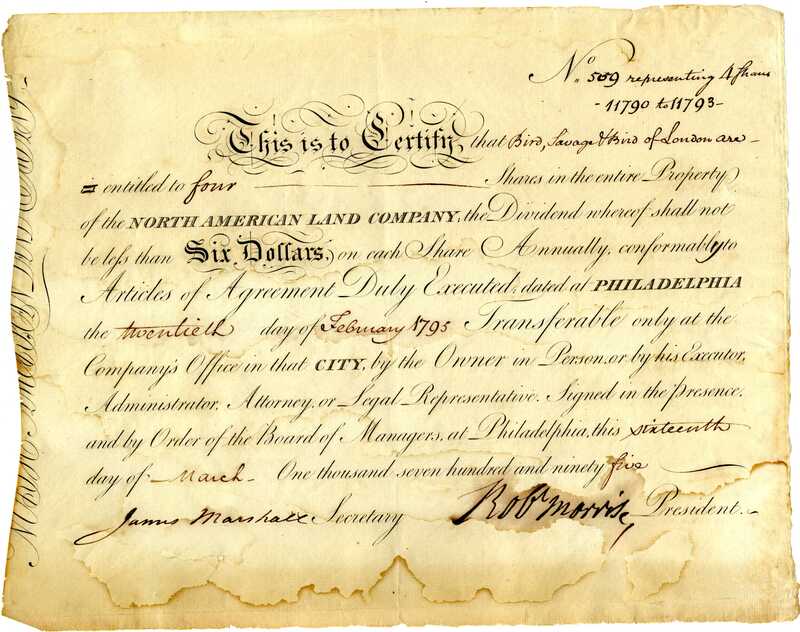 Certificate held by Bird, Savage and Bird of London for four shares of stock in the North American Land Company signed by Robert Morris, President and James Marshall, Secretary, 1795. One state, one vote was the philosophy of the New Jersey Plan. Borrowed from the Articles of Confederation, the concept of a unicameral legislature also known as the Paterson Plan, was introduced by William Paterson with the support of his fellow delegates. The plan provided for a single legislative body with each state receiving equal representation. The New Jersey Plan drew support from the other less populous states and became the state’s legacy at the Convention. Elements of the New Jersey Plan were incorporated into the Connecticut Compromise. William Paterson was born in Ireland and his family immigrated to America when he was a child. He studied law under Richard Stockton, a signer of the Declaration of Independence. 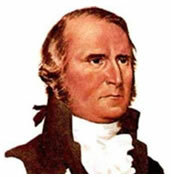 During the American Revolution, Paterson served in various legal positions including Attorney General for New Jersey. He retreated from public life to private law practice after the war, when he was called to serve at the Constitutional Convention. At the Convention, Paterson favored protections for the smaller states in the New Jersey Plan. 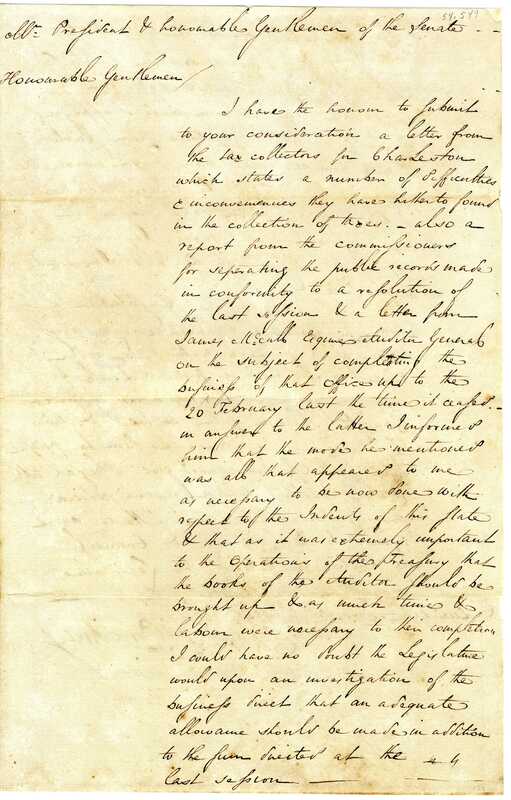 After Paterson made his case for the smaller states he left the Convention in July, only returning to sign the document in December when New Jersey became the third state to ratify. 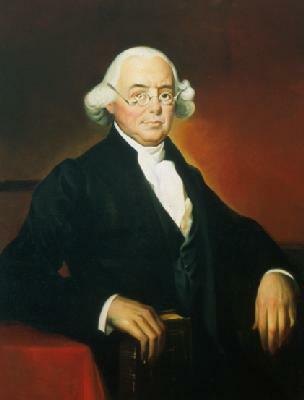 Paterson would go on to serve as an associate justice of the Supreme Court until his death in 1806. 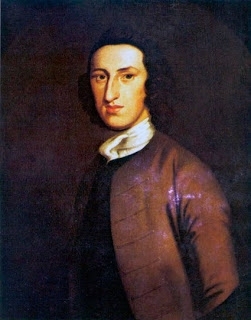 William Livingston was serving as the first governor of New Jersey when he was elected to serve at the Constitutional Convention. Because of his gubernatorial duties, he was delayed arriving to the Convention and also missed several sessions. However, he still accomplished a great deal. He served on the committee that helped develop a resolution on slavery. Livingston himself opposed the practice. He supported the New Jersey Plan and pushed for the state’s swift ratification. Livingston did not live long after the Constitution was ratified. He died in 1790. New Jersey’s original delegation consisted of five people. Due to failing health, William C. Houston left the Convention after a week. Delegates David Brearley and Jonathan Dayton actively supported the efforts of the more respected Paterson and Livingston. At the Convention, Brearley attended sessions regularly and chaired the Committee on Postponed Matters. As a junior delegate, Dayton spoke and debated at the Convention occasionally. At age 26, Dayton was the youngest signer of the Constitution. 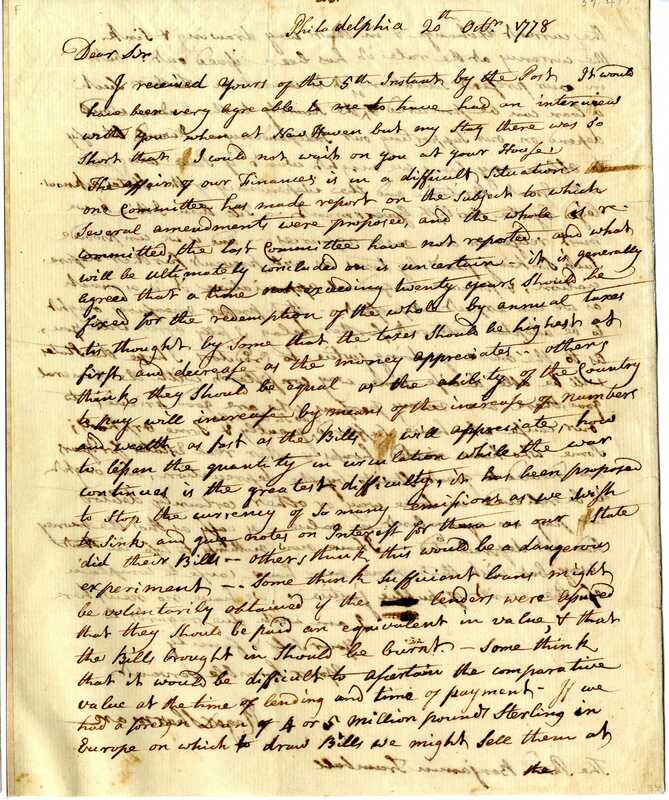 Letter from William Paterson to the Honorable William Coxe, Speaker of the New Jersey General Assembly, concerning preparing legislative bills, 1799. 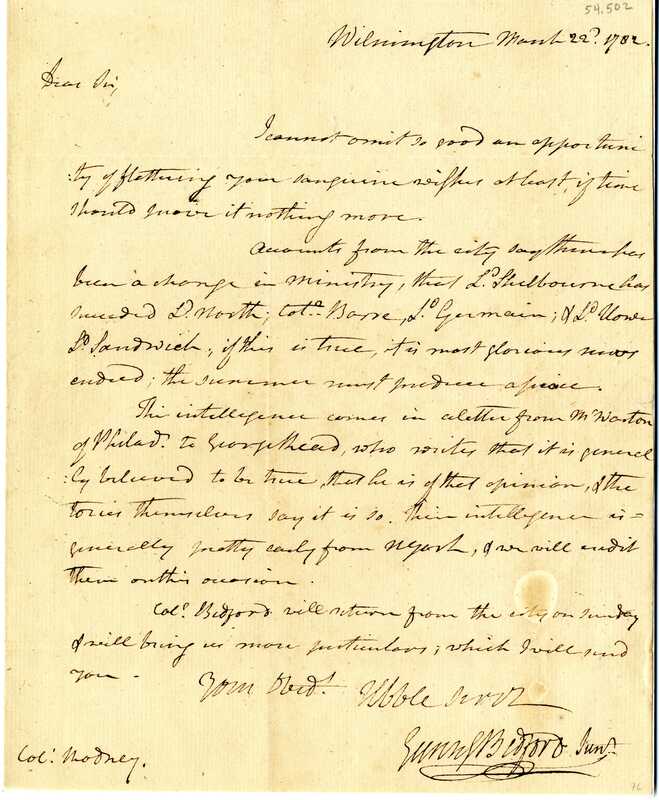 Letter from William Livingston to Reverend Mr. White regarding a recommendation for Mrs. Duché to relocate to New York City, 1780. 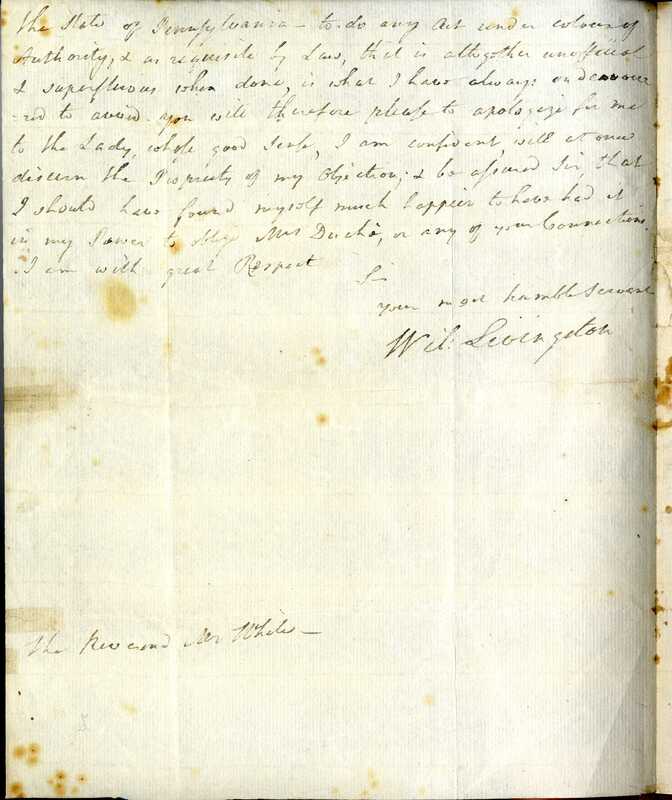 Letter from David Brearley to the Honorable Francis Hopkinson. 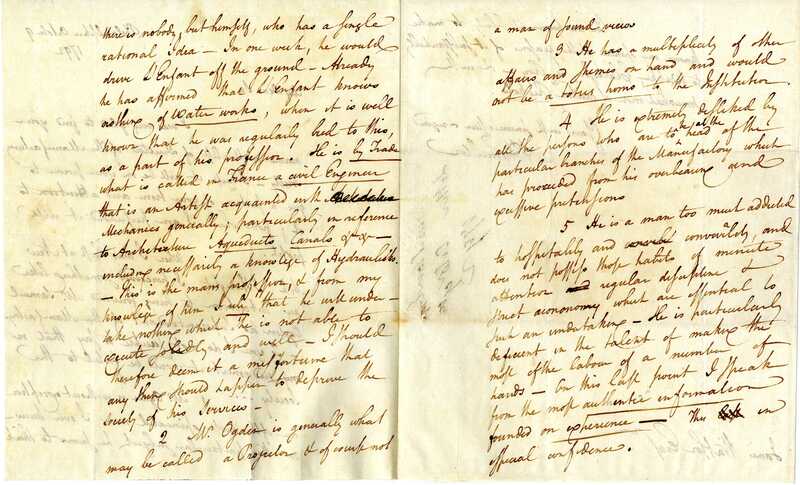 In this letter David Brearley gives his opinion of a court case and concludes, “The only thing which can be of any service to the gentleman is a report of the case, – this I have enclosed, but how far he will be able to make use of it is a question which I cannot answer.” 1789. 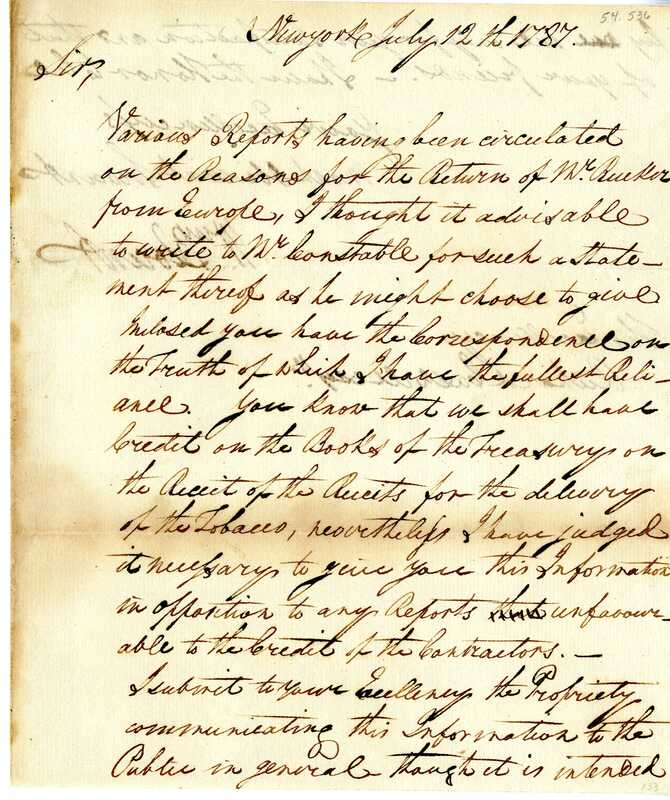 Letter from Jonathan Dayton to Commodore Barry. Dayton was the youngest signer of the Constitution. 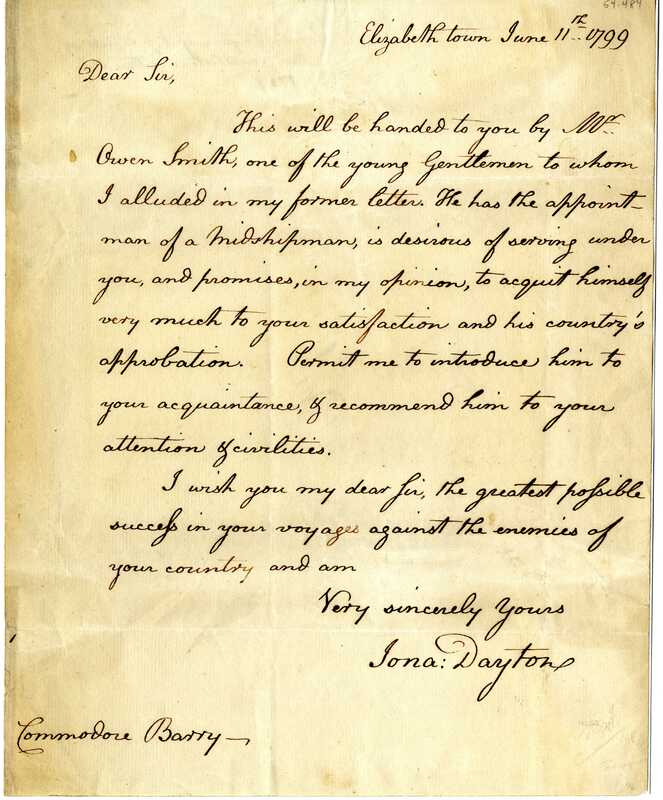 In this letter, he endorses Midshipman Owen Smith to serve under Commodore Barry, 1799. 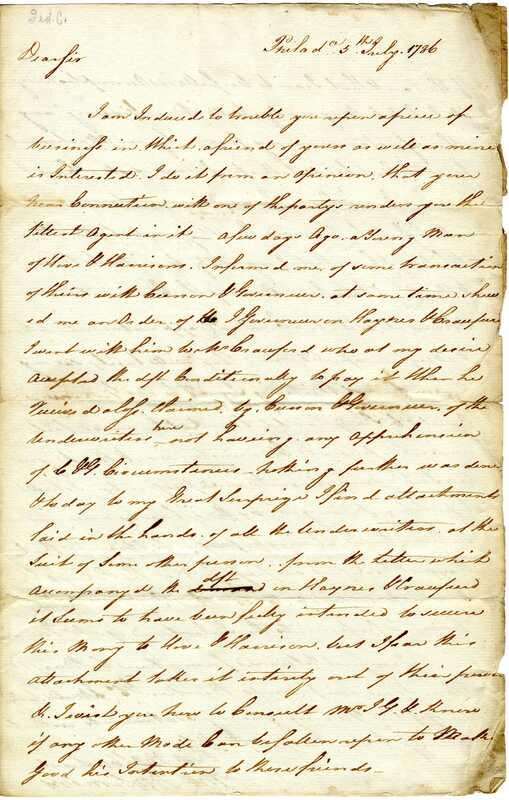 As representatives from a large southern state, the Georgia delegates focused intently on a protective federal government and the right to own slaves. Georgia was established as a British colony in the 1730s, making it the youngest and least developed of the original thirteen colonies. Many early Georgians adopted the state as their own after moving there later in life. 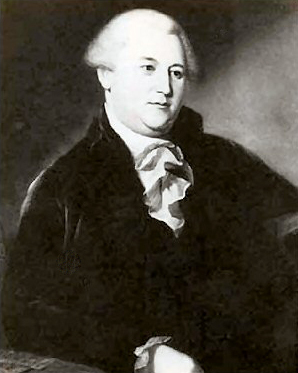 Abraham Baldwin, a native of Connecticut, came to Georgia to practice law after attending Yale and serving as a chaplain in the American Revolution. 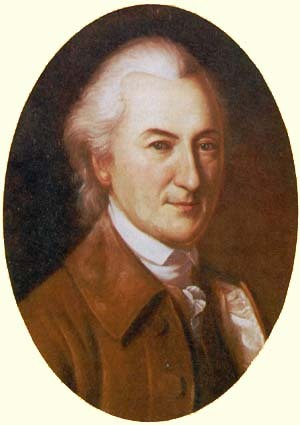 He later represented Georgia at Continental Congress. At the Constitutional Convention, Baldwin originally expressed a preference for property-holders, but eventually voted in favor of representation by state population. Despite an extended absence, he served on the Committee on Postponed Matters and signed the finished Constitution in September 1787. Baldwin went on to serve 18 years in the U.S. Congress, and was a founder of the University of Georgia as well as its first president. 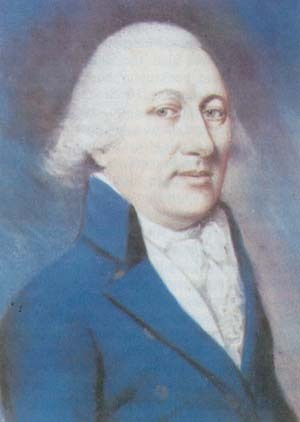 After his military service in Georgia during the American Revolution, William Few was elected to various offices in the state’s government including surveyor-general and representative in the Continental Congress. 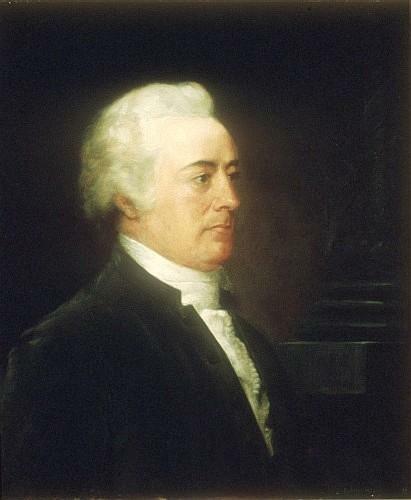 Although his congressional duties prevented his attendance at many Constitutional Convention proceedings, he did contribute votes in support of a strong national government and helped in the Constitution’s ratification in Georgia. Few was elected a United States Senator but returned to Georgia politics after his first term. He later moved to New York where he continued to hold both public and private positions. 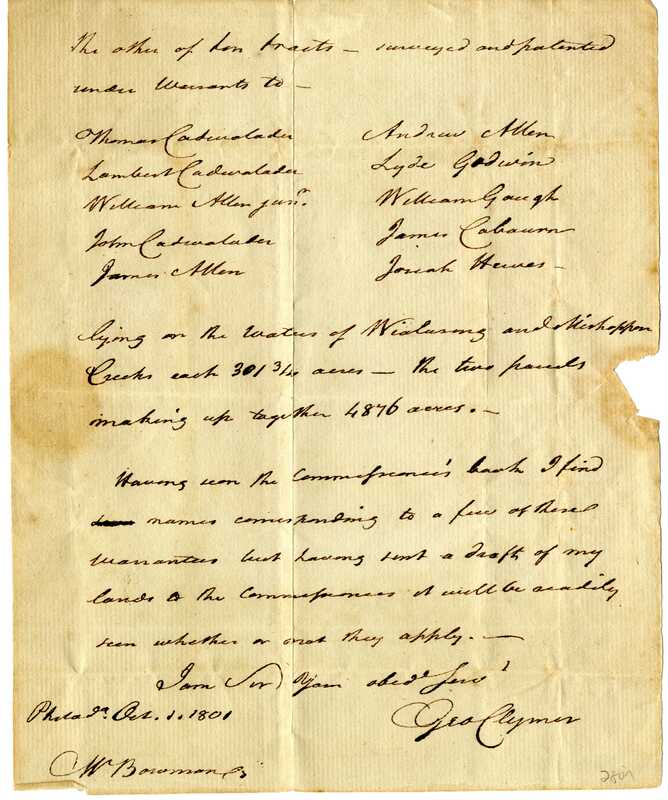 Six men were originally selected to represent Georgia at the Constitutional Convention. Two never attended and two left the proceedings early. 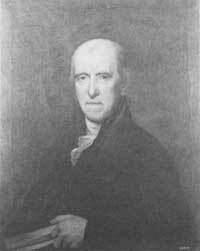 William Houston, also a member of the Continental Congress, split Georgia’s vote at the Convention when he disagreed with equal representation in the Senate. He left Philadelphia in July. 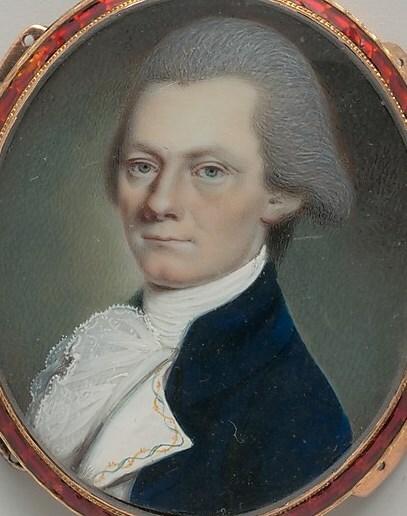 William Leigh Pierce, a decorated Revolutionary War veteran and Georgia politician, supported the Constitution and participated in three debates at the Convention. He was forced to leave the Convention early because of business troubles. 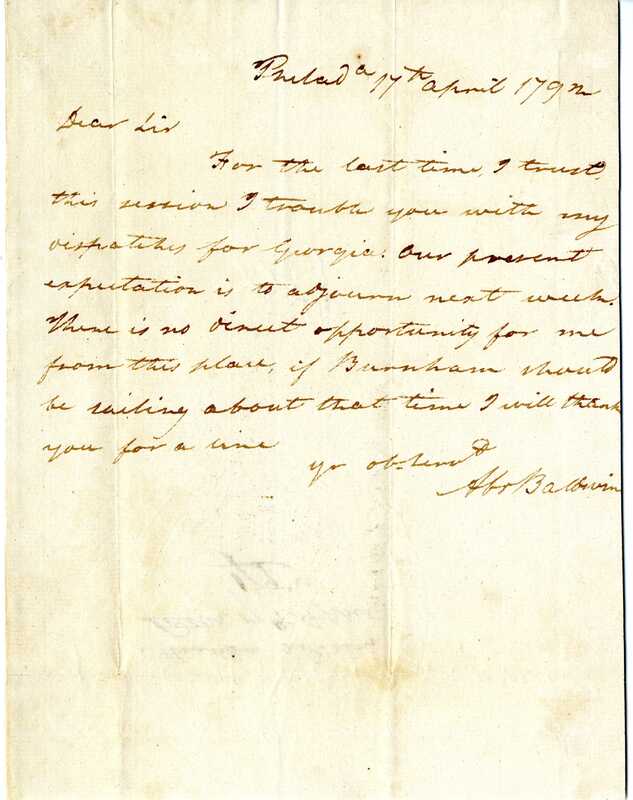 Letter from Abraham Baldwin to an unknown recipient regarding dispatches and his future return to Georgia after the adjournment of the U.S. Congress, 1792. 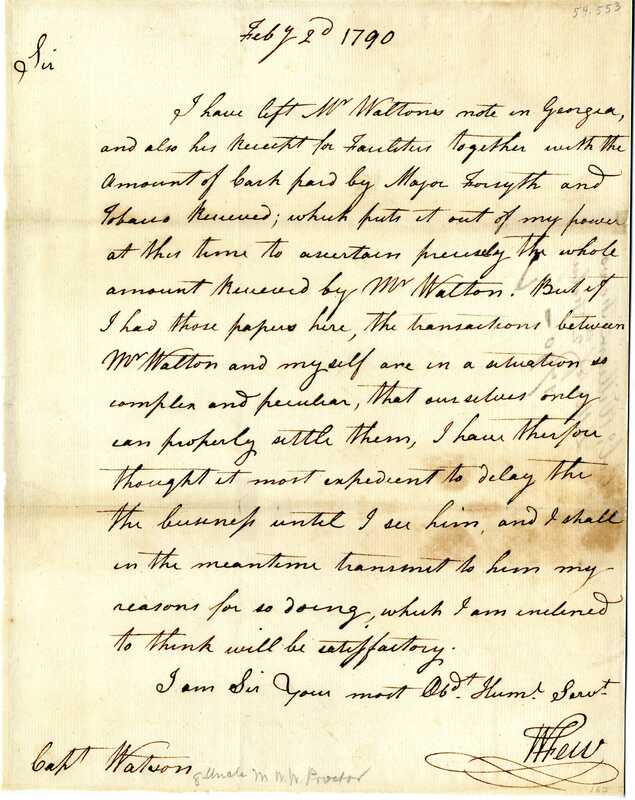 Letter from William Few to Captain Watson regarding a business transaction with a Mr. Walton, 1790. The small, three-member delegation from Connecticut played an extremely significant role at the Constitutional Convention. 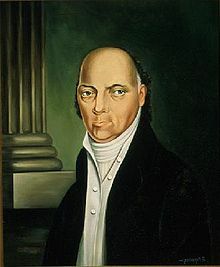 The Connecticut Compromise, also called the Great Compromise, was crafted by Oliver Ellsworth and Roger Sherman. It combined the ideas of both the Virginia Plan, which favored larger states, and the New Jersey Plan preferred by smaller states. Under the Connecticut Compromise, the government’s bicameral legislature would be comprised of a House of Representatives with a population-based number of delegates, and a Senate with two members from each state. This compromise also incorporated the “three-fifths” rule which counted three-fifths of the total number of non-citizens from each state toward the population. The Connecticut Compromise solved the struggle between small and large states that was hindering the success of the Convention. 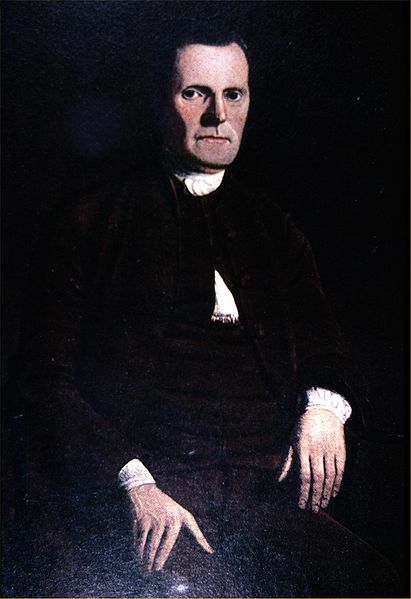 Roger Sherman was a resourceful businessman, lawyer, judge, and politician. As an active participant in the new government of the United States from its inception, he is the only person to have signed all four of these founding documents: the Articles of Association, the Declaration of Independence, the Articles of Confederation, and the Constitution. 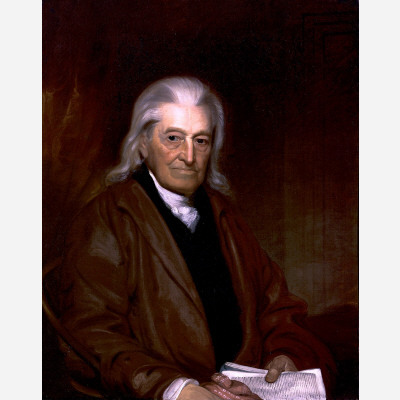 At the Constitutional Convention, he helped create the Connecticut Compromise, worked on the Committee on Postponed Matters, and advocated against the use of paper money. Sherman later served Connecticut in the U.S. House of Representatives and the Senate. After William Samuel Johnson arrived at the Convention, he did not miss a single day of the proceedings. As a career politician for Connecticut, he debated passionately in favor of equal representation for small states. 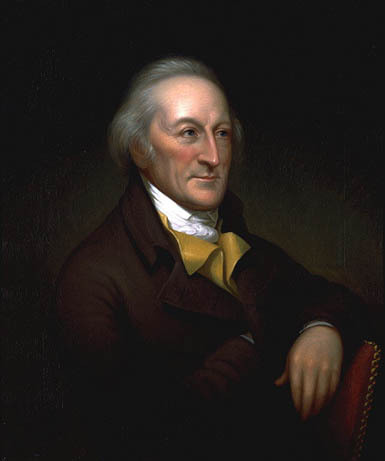 He strongly supported the Connecticut Compromise and served as chair of the Committee of Style which molded the final version of the Constitution. Johnson worked toward ratification in Connecticut. He later served in the United States Senate and as president of Columbia College. 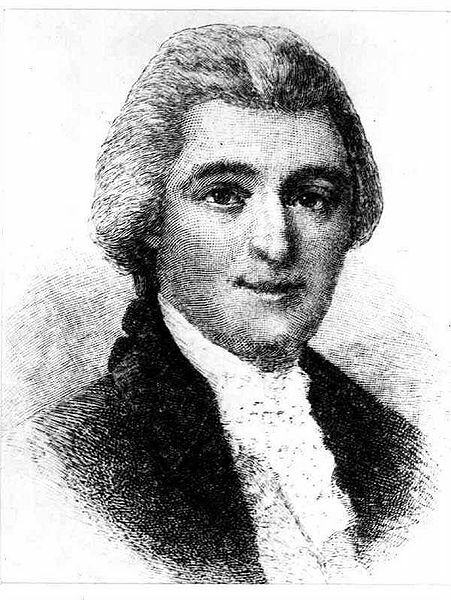 Connecticut delegate Oliver Ellsworth left the Convention before signing the Constitution. 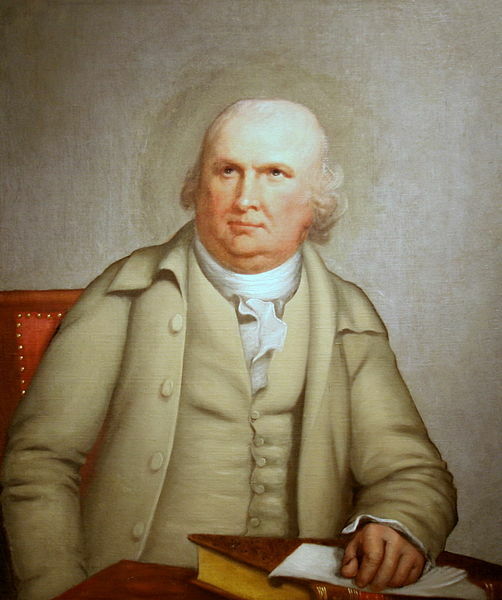 However, because of his role in creating the Connecticut Compromise and on the Committee of Detail, he was instrumental to the success of the Constitution. Ellsworth was appointed Chief Justice of the Supreme Court in 1796. 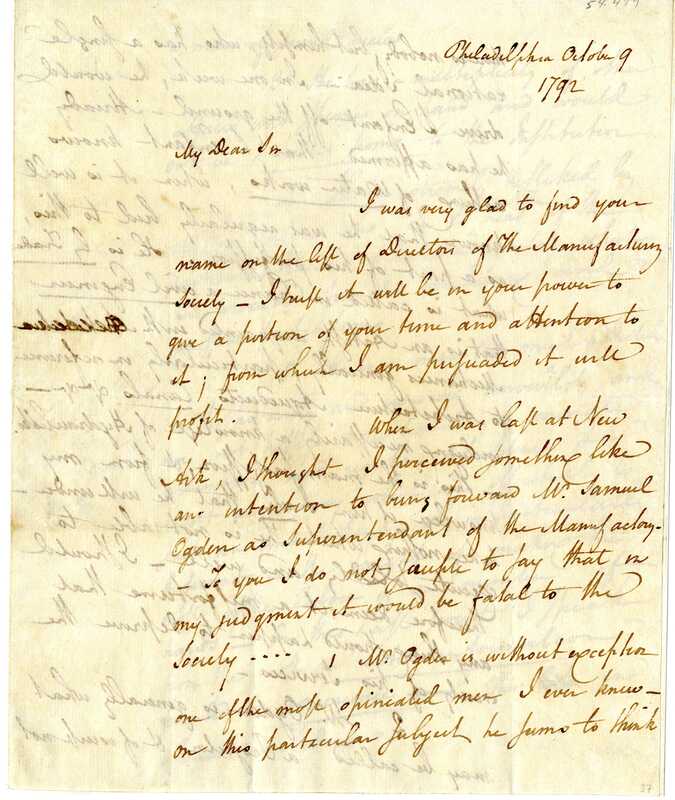 Letter from Roger Sherman to Reverend Benjamin Trumbull discussing the state of the colonies’ finances and currency, 1778. 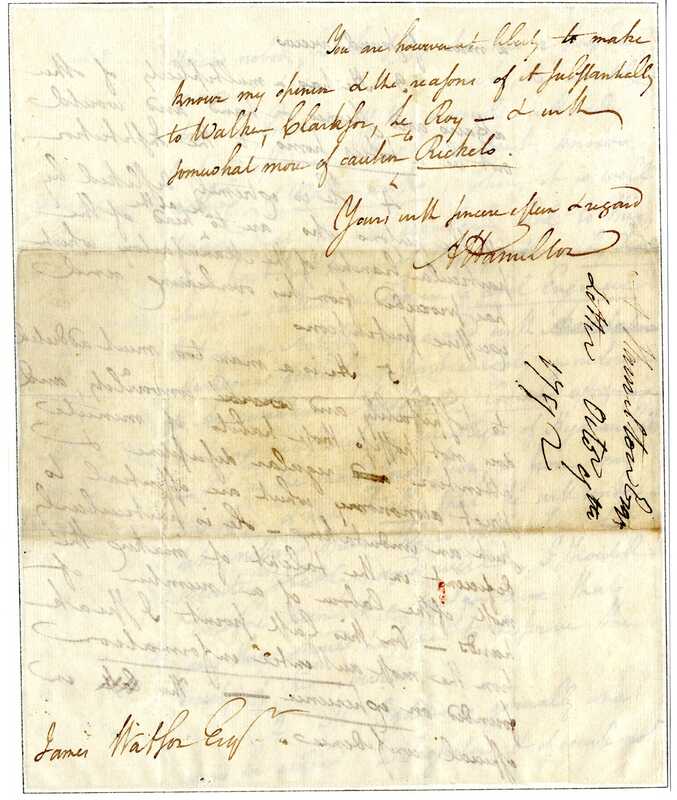 Letter from William Samuel Johnson to Oliver Woolcot regarding sending papers, 1755. Massachusetts has a significant place in American history. Because several defining events occurred in this state, such as the Boston Tea Party and the first battle of the Revolutionary War at Lexington and Concord, it is often referred to as the “cradle of liberty.” Additionally in 1786 Shays’ Rebellion occurred in western Massachusetts. During this event, a group of farmers revolted against local circuit courts for the collection of taxes deemed necessary by the young nation’s governing document, the Articles of Confederation. The aftermath of this uprising brought attention to the need for revision of the Articles of Confederation and ultimately led to the calling of the Constitutional Convention held in Philadelphia. Massachusetts sent four men as delegates to the Convention. Rufus King was born in 1755 in present day Scarborough, Maine. 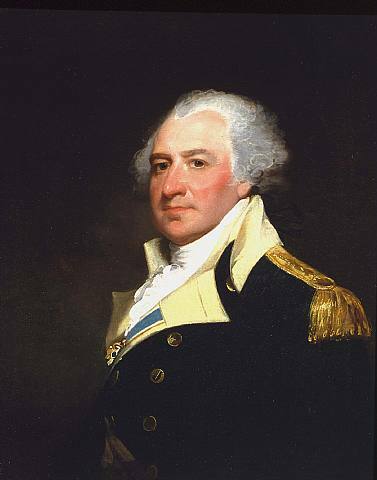 Amidst the American Revolution King graduated from Harvard before briefly serving as an aide to a General. 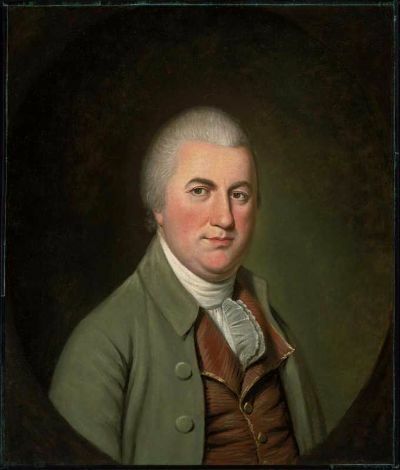 He started a law practice in Newburyport, Massachusetts and then began his political career by serving as a member of the Massachusetts Legislature, resulting in his service as a Massachusetts delegate to Continental Congress from 1784 to 1786. During this time he became well known as a brilliant orator and as an early opponent of slavery. At age 32, his state sent him to represent its interests at the Constitutional Convention. King went into the Convention thinking the Articles of Confederation needed no major changes. He is known for attending every session of the Convention, and with time he saw the need for change. King joined James Madison in promoting a federal agenda. He also worked with Alexander Hamilton in preparing the final draft of the Constitution on the Committee of Style and Arrangement. Nathaniel Gorham was born in Charlestown, Massachusetts in 1738. As a young man, he was apprenticed as a merchant before he began his own business. Gorham entered public service as a notary, but was soon elected to the colonial legislature and later served on the Massachusetts General Court. He went on to represent his state as a delegate to the provincial congress from 1774 to 1775 as well as the Continental Congress from 1782 to 1783 and 1785 to 1787. Gorham also represented his state at the Constitutional Convention. Here he was a nationalist who served as the chairman of the Committee of the Whole and sat on the Committee of Detail. After the convention he worked to ratify the Constitution at the Massachusetts ratifying convention. Two of the men that Massachusetts sent to the Convention did not sign the Constitution. 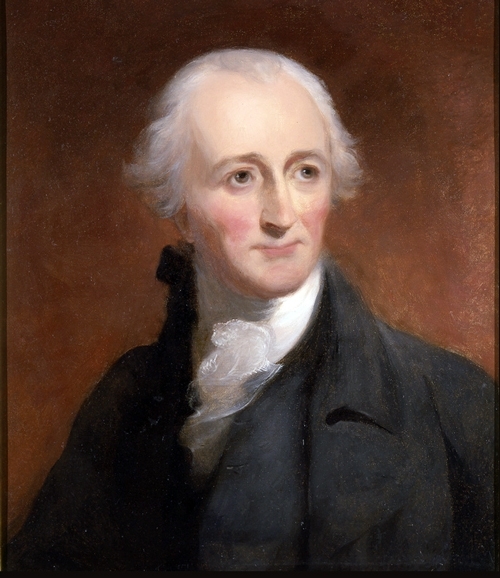 Elbridge Gerry served his state as a politician in various ways before later serving as James Madison’s vice president. He opposed the Constitution because it did not contain a Bill of Rights and therefore did not sign it. Lawyer and politician Caleb Strong found fault with the delegates’ decision to use an electoral college to elect a president, rather than electing this position through a legislative body. Strong left the convention early due to his wife’s ill health and did not sign the document. However, he supported the Constitution at the Massachusetts ratifying convention. 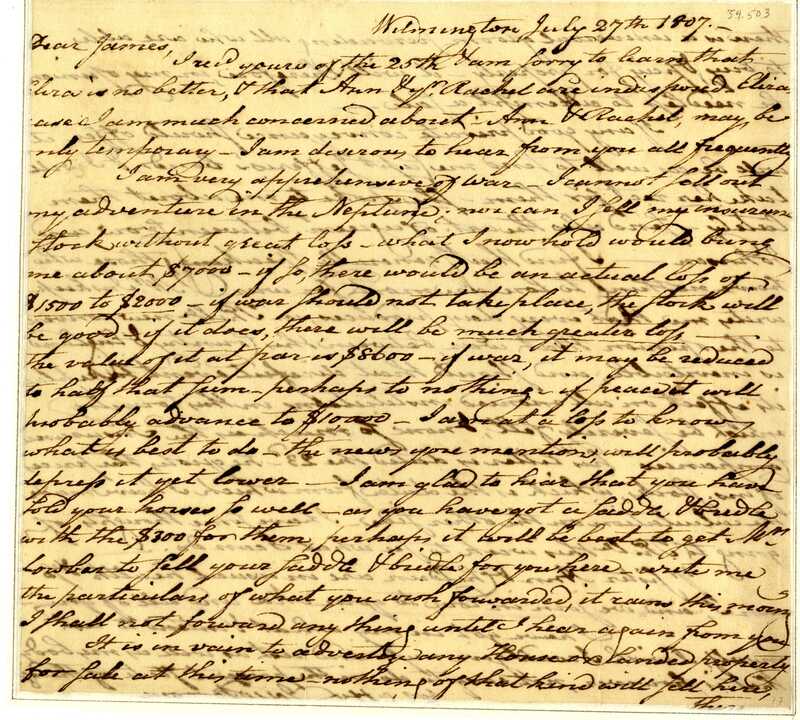 Letter from Nathaniel Gorham dated Charles Town, 1783. Maryland’s original delegation to the Constitutional Convention consisted of five men. However, they were quite divided and compromise was not promising. Luther Martin and John Francis Mercer walked out of the Convention before the proceedings commenced due to a lack of support for their positions on the style of legislative representation and the development of a juryless Supreme Court. 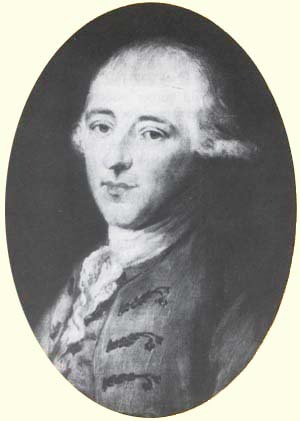 James McHenry was born in Ireland. He trained as a doctor and served as a Major and military surgeon during the American Revolution. During the war, McHenry served directly under George Washington and Marquis de Lafayette. 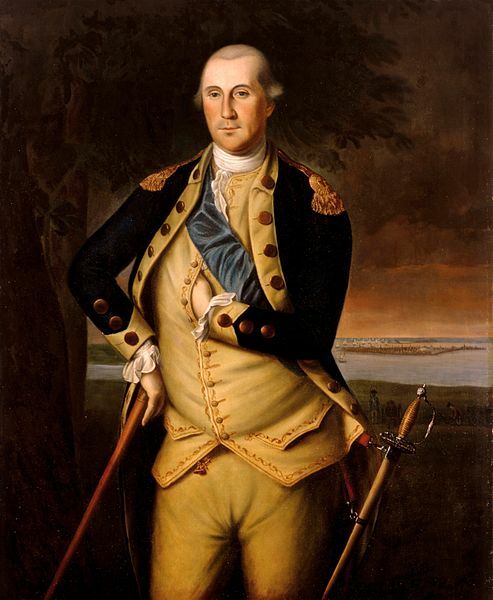 After the war, he was elected to the Maryland state legislature and later appointed as a delegate to the Convention. 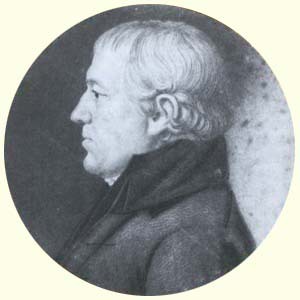 McHenry supported a strong central government; however, his role at the Convention was minor. 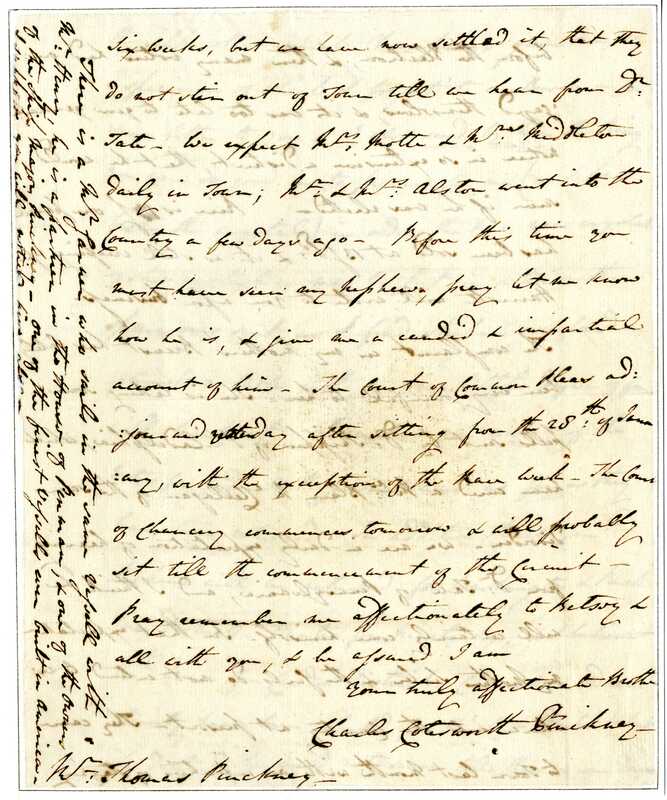 Historians credit McHenry for his meticulous note taking during the Convention’s proceedings. 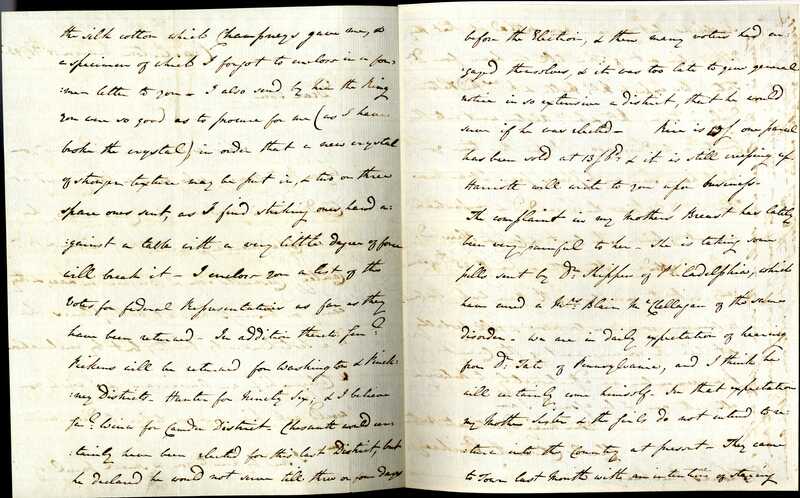 His journals offer great insight into the Convention and the Constitution’s development. Not much is known about the beginnings or even the burial location of Daniel of St. Thomas Jenifer; however, he remained at the Convention on behalf of Maryland. He supported the Revolutionary cause and served the state of Maryland in various high-ranking positions throughout the war. Jenifer regularly attended the Convention sessions, though he did not speak much. He supported his friend James Madison’s idea of a strong national government and favored a legislature with taxation powers. Jenifer died three years after the Constitution was signed. 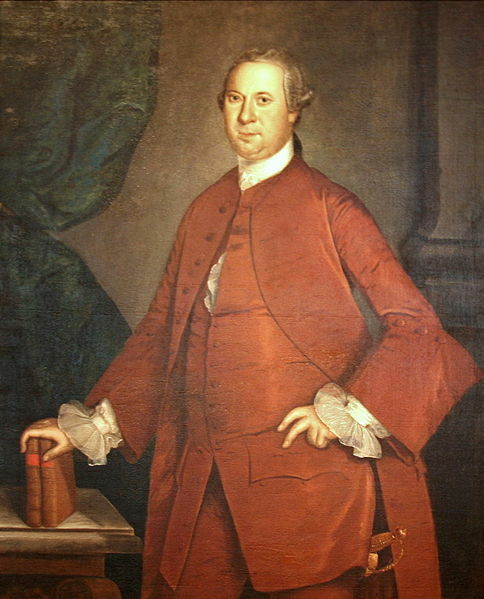 Daniel Carroll played a larger role on behalf of Maryland at the Constitutional Convention. The gentleman farmer from Upper Marlboro served on the Committee on Postponed Matters. He supported a strong national government primarily for the regulation of commerce. Carroll also supported the idea of popular sovereignty, believing that the people, not Congress, should elect the president. Daniel Carroll arrived late to the Convention, but attended sessions regularly. The remaining members of the Maryland delegation offered support to the nationalism elements of the Virginia Plan. McHenry and Jenifer, though not recognized as elder statesmen, voiced their concerns and opinions when necessary. 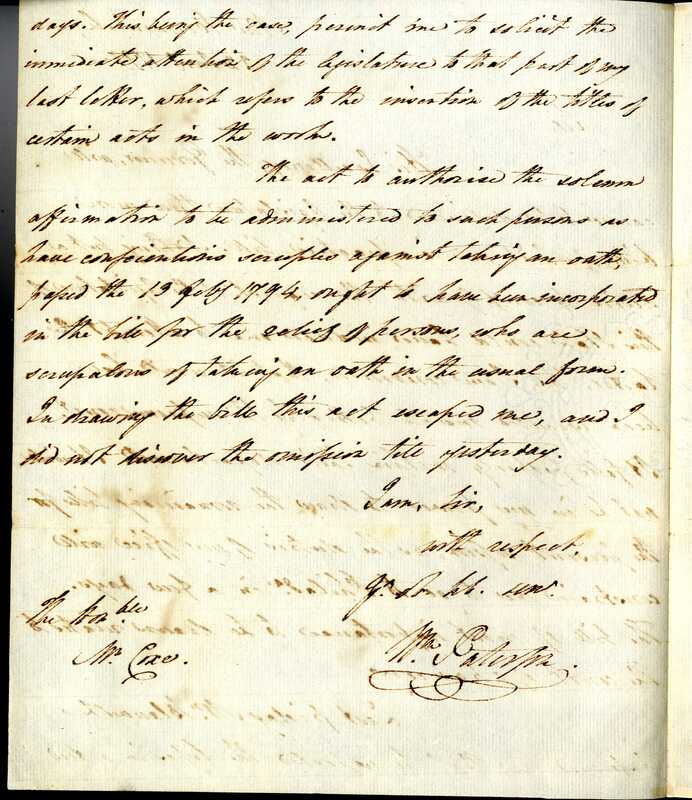 Carroll’s service on the Committee on Postponed Matters helped finalize the document. 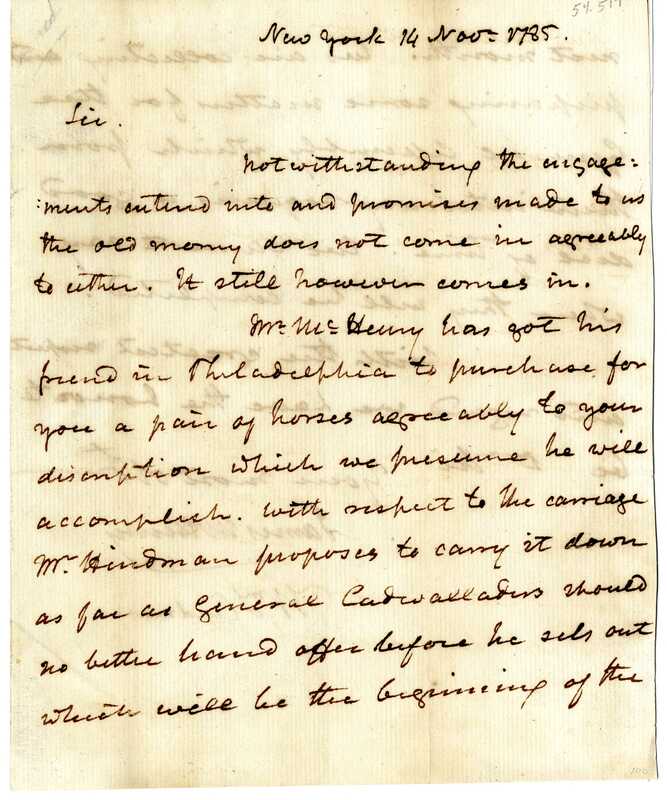 Letter from James McHenry negotiating the sale and delivery of a pair of horses and a carriage, 1785. 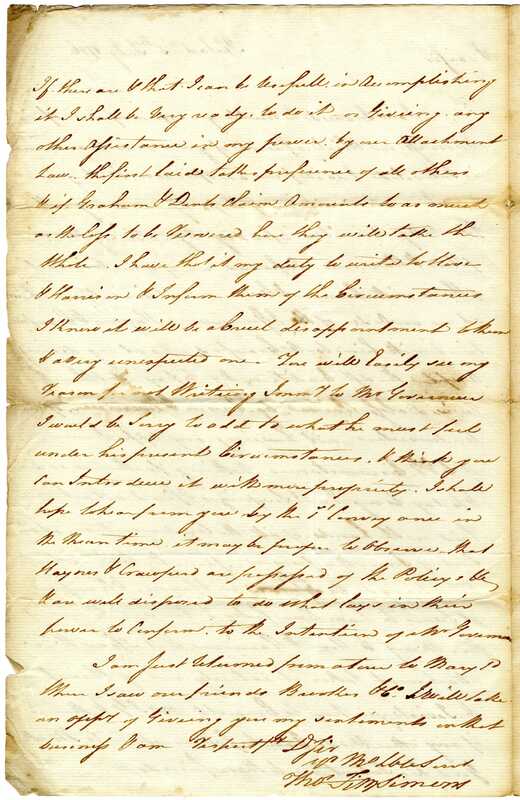 Letter from Daniel of St. Thomas Jenifer to William Homfley. 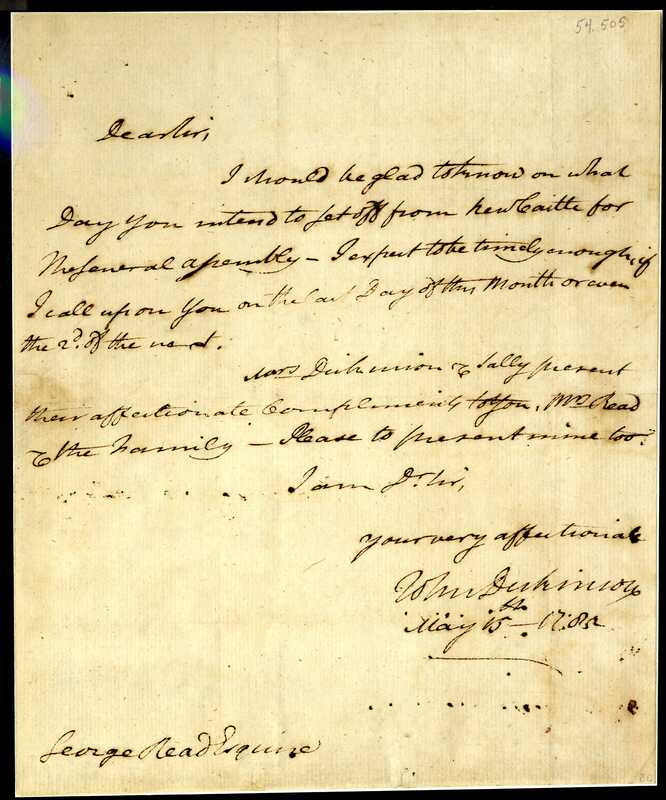 Written during Jenifer’s tenure as President of the Maryland State Senate, this letter notifies William Homfley of his election as a senator in the Maryland legislature during the American Revolution, 1779. Letter from Daniel Carroll regarding payment to Mr. Mullahan. 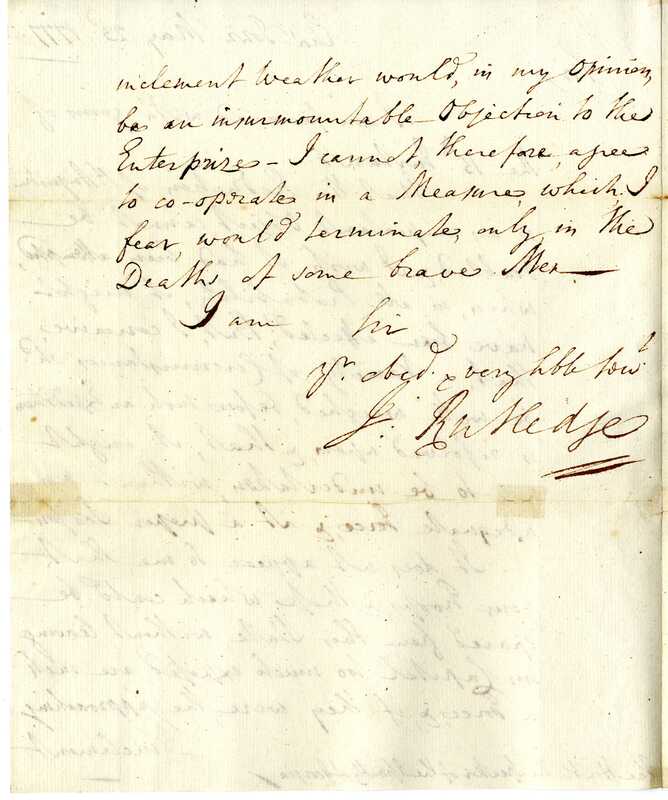 Carroll explains that he has submitted this letter regarding payment “either to lay before the council, or to send to Maj. Jennifer who writes that he is going to St. Mary, where he will have -- -- an opportunity of seeing Mr. Mullahan.” 1782. In 1787, South Carolina was one of America’s wealthiest states and most dependent on slave labor which served to maintain and increase its wealth. South Carolina was represented by John Rutledge, Charles Cotesworth Pinckney, Charles Pinckney, and Pierce Butler, all of whom were reluctant to compromise on the issue of the slave trade. They tried to impose their perspective on the Convention as a whole with mixed results. All four delegates believed that a new constitution was necessary to correct the problems of the Articles of Confederation. 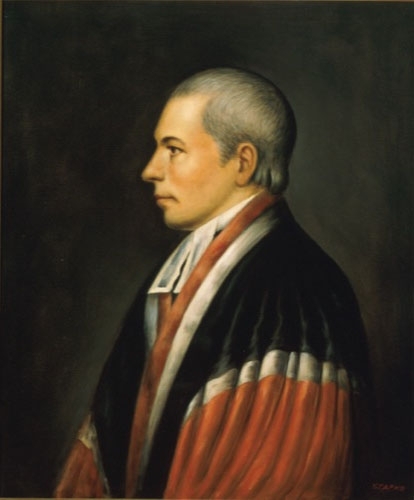 John Rutledge’s reputation as a barrister and governor preceded him. He spoke often and convincingly especially in defense of the slave trade. He is at least partly responsible for keeping any prohibitive language regarding slavery out of the Constitution. He chaired the five-person Committee of Detail, responsible for drafting the Constitution, and is considered a major contributor to the document. 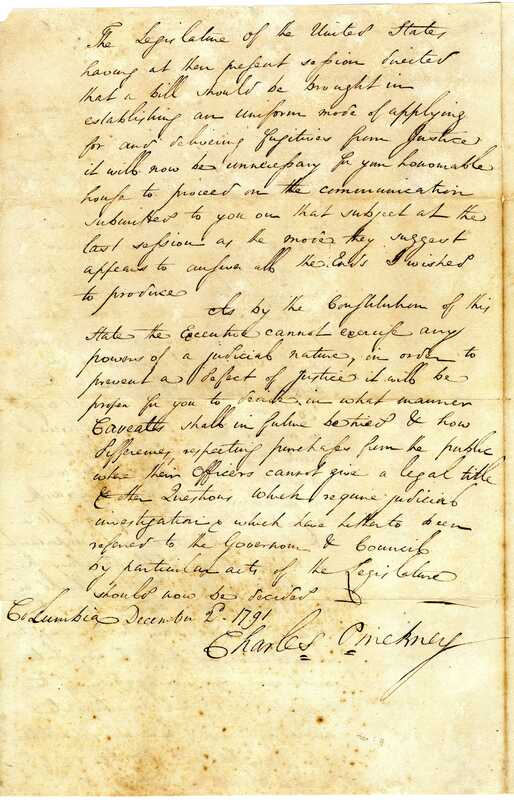 Charles Cotesworth Pinckney had an excellent grasp of the law and wasn’t afraid to speak up. Pinckney believed that no senator should receive a salary, which would have ensured that only wealthy men served in that capacity. He also insisted on provisions in the document to protect religious freedom. Pinckney is best known as a bold defender of the southern way of life. He thought that slaves should be counted 100 percent toward a state’s total population; the larger a state’s population, the more power it would have in the new Congress. But non-slaveholding delegates saw this stance as hypocritical since enslaved blacks were not free humans and were considered property. Pinckney was willing to compromise on this point if someone would meet him and his fellow delegates halfway. In the end, the Convention met them three-fifths of the way. 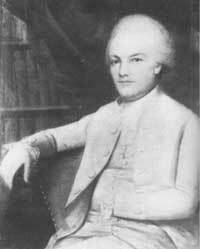 Charles Pinckney, the second cousin of fellow signer Charles Cotesworth Pinckney, attended the Convention at the age of 29. Although still young, he spoke forcefully and reportedly more than 100 times. He strongly urged the states to strengthen the central government. Pierce Butler also worked diligently on behalf of a strong central government. It was he who suggested that the delegates keep all deliberations secret, a measure that the Convention adopted on the first day. Butler spoke about 70 times during the proceedings, and not always with consistency. 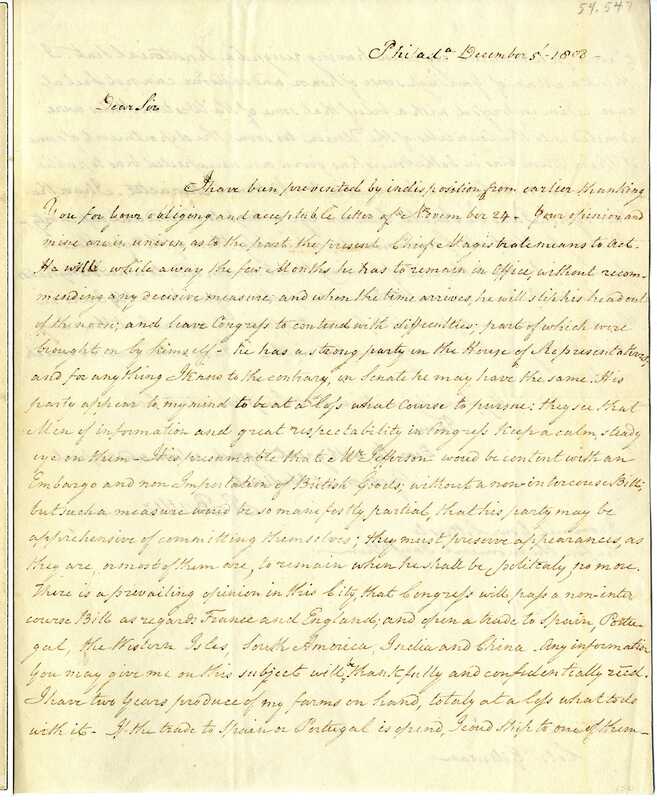 Letter from John Rutledge objecting to an expedition against St. Augustine. 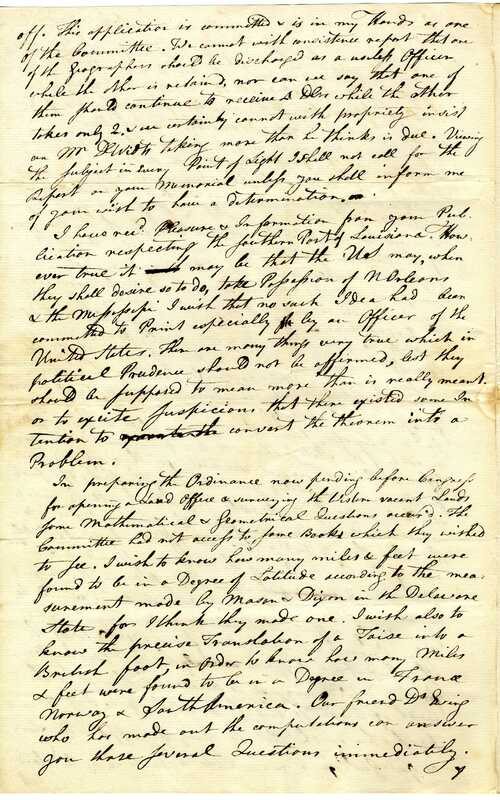 Citing a lack of “adequate forces” and “approaching inclement weather,” Rutledge explains to a military leader that he “cannot, therefore, agree to cooperate in a measure which I fear would terminate only in the deaths of some brave men.” 1777. 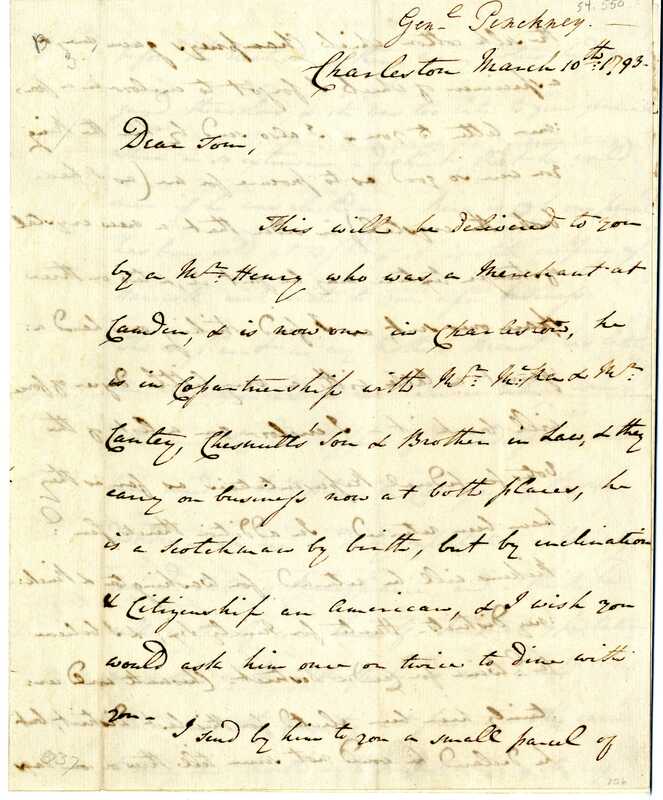 Letter from Charles Cotesworth Pinckney to his brother, Thomas, concerning a request for a dinner invitation to a merchant and discussing a recent family visit, 1793. 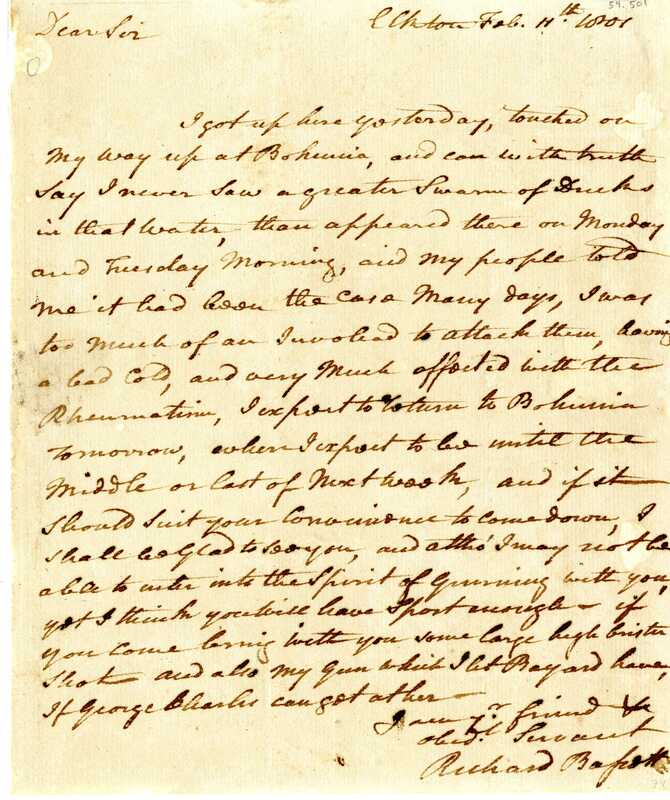 Report from Charles Pinckney to “Mr. President & Honorable Gentlemen of the Senate” on matters concerning tax collectors in Charleston and the commissioners for separating the public records, 1791. 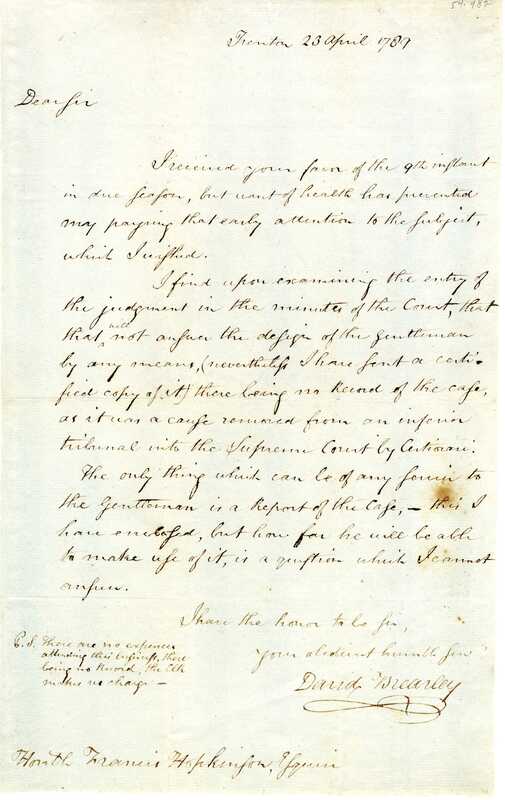 Letter from Pierce Butler to Colonel Gillman regarding Butler’s dissatisfaction with the influence congressmen from the western states have on trade issues during the Jefferson administration, 1808. Life in revolutionary era New Hampshire was defined by the gap between the wealthy urban mercantile class of the coast which was a contrast to the class of laborers, mariners, servants, and slaves. 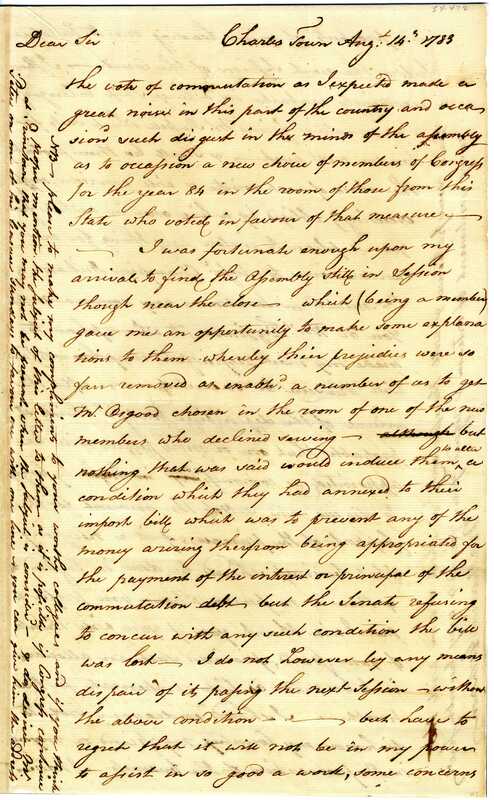 New Hampshire sent two delegates to the Constitutional Convention, and both signed the document. However, the state was unwilling or unable to pay the way for the men to attend the Convention. 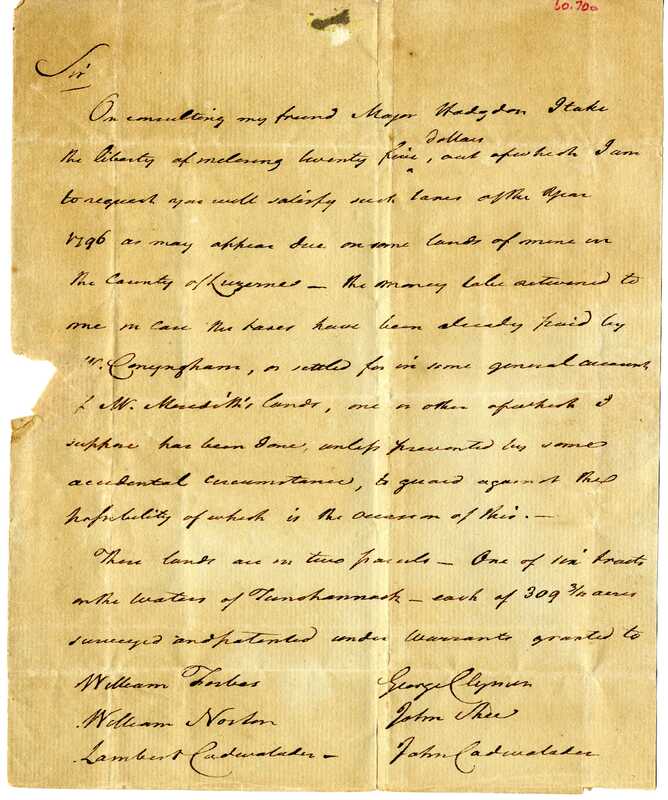 John Langdon paid not only his expenses, but also supported his fellow delegate, Nicholas Gilman, in Philadelphia. 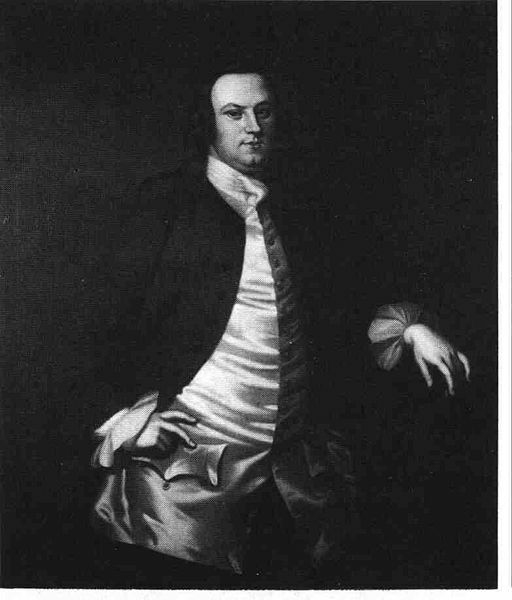 John Langdon from Portsmouth, New Hampshire was an early and strong supporter of the American Revolution, attending the Continental Congress from 1775 to 1776. He went on to serve three terms in this congress. 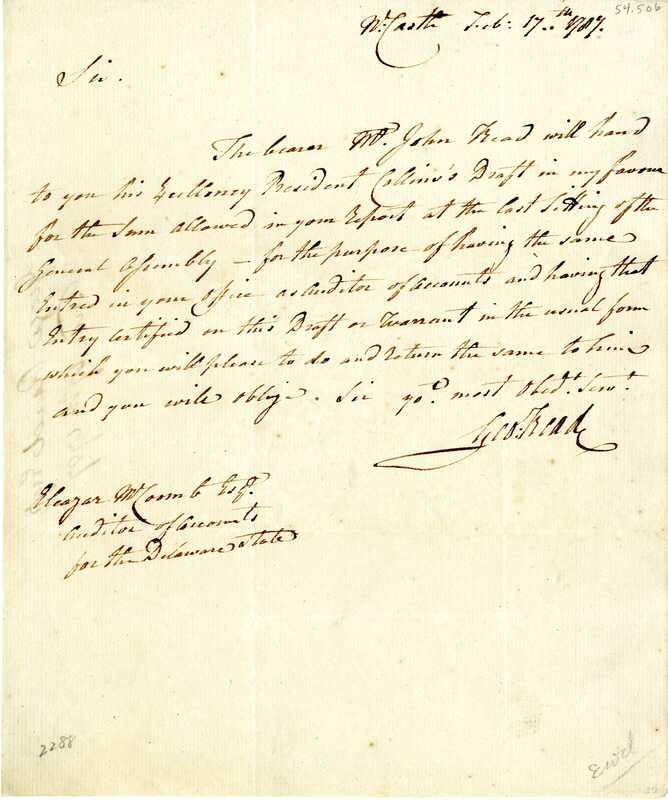 In 1777 Langdon paid for and organized General John Stark’s campaign against British General John Burgoyne. In addition to this, he was also involved in his state militia. Langdon arrived at the Constitutional Convention in late July, missing out on many important debates. In order to express his state’s needs, he spoke more than 20 times at the Convention. He supported a strong national government and spoke out against giving the Senate more power than the House of Representatives. Nicholas Gilman of Exeter, New Hampshire served the Continental Army during the Revolutionary War. He enlisted in the New Hampshire section of the army and rose to the rank of Captain. During the war, he also worked at his father’s store and began to get involved in politics. He represented New Hampshire at the Continental Congress from 1786 to 1788. In 1787 he attended the Constitutional Convention, although he did not arrive in Philadelphia until late July, therefore missing much of the major business of the Convention. Nevertheless, he served on the Committee of Postponed Matters. He supported the Constitution in both his state and in sessions of the Continental Congress. 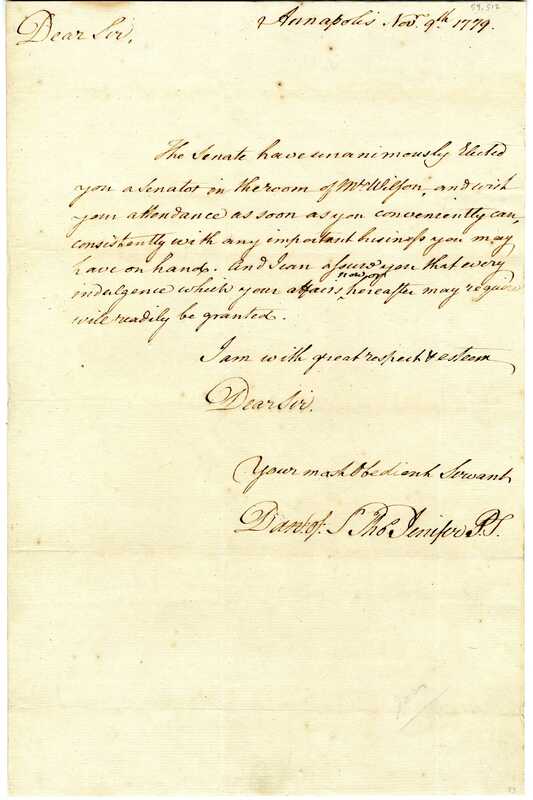 Letter from John Langdon to Joseph Whipple discussing Congressional business, 1791. 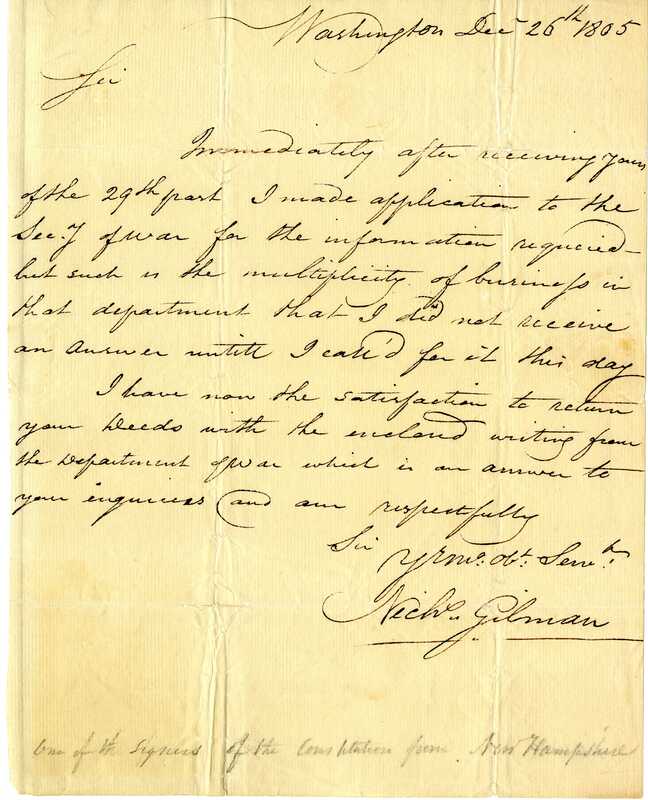 Letter to an unknown person from Nicholas Gilman of New Hampshire, 1805. Although Virginia sent the second largest delegation to the Constitutional Convention with seven members, only three signed the Constitution. The Virginia delegates, however, were some of the most well-known and influential of those present at the Convention. 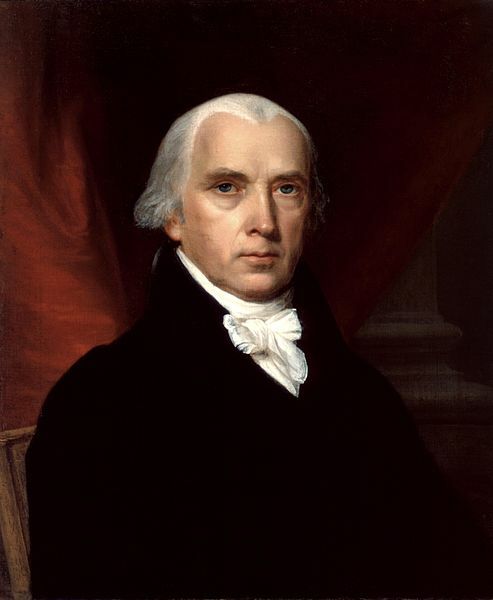 James Madison represented Virginia at Continental Congress during the 1780s. In preparation for the Constitutional Convention he drafted the Virginia Plan, also known as the “Large-State Plan,” which outlined a strong central government with a bicameral legislature and an executive office. The Virginia Plan served as the foundation for most of the Convention’s discussions. Madison served on several committees during the Convention and was a vocal participant in deliberations. During the process of ratification by the states, Madison became the Constitution’s strongest supporter. The detailed journal he kept during the Constitutional Convention was later published and contains the most complete account of the proceedings. Madison later worked on the Bill of Rights and was one author of the Federalist Papers. He served as Secretary of State under President Thomas Jefferson and was elected president in1808. He is often called the “Father of the Constitution” for his preeminent role in its creation and ratification. George Washington hosted a conference at his home in Mount Vernon in 1785 to discuss the limitations and failures of the Articles of Confederation with other statesmen. After joining the Virginia delegation, he was unanimously elected President of the Constitutional Convention. Washington’s support of the Constitution’s ratification may have positively influenced those who otherwise would have opposed. While he did not passionately debate the issues, he voted on each article and maintained order amongst conflicting personalities. Later, as the first President of the United States, George Washington’s bipartisan leadership and stability helped unify the United States under the new laws of the Constitution. John Blair came to the Constitutional Convention with ample experience in law and government. As a lawyer and judge in the state’s court system, he helped create the Virginia Declaration of Rights. At the Constitutional Convention, Blair was attentive but quiet, and voted with the other Virginia delegates. He ardently supported the ratification of the Constitution and its framework for a new government. 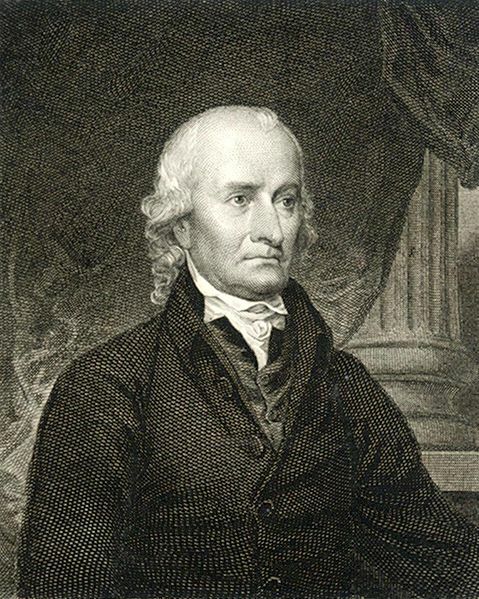 George Washington selected John Blair as an associate justice of the U.S. Supreme Court in 1789. He retired from that position in 1795. Four delegates from Virginia did not sign the Constitution. James McClurg, a physician who favored a strong federal government, left the Convention in August. George Wythe, who signed the Declaration of Independence and was a friend and mentor to Thomas Jefferson, also left the proceedings early. George Mason and Edmund Randolph, however, were present but refused to sign. 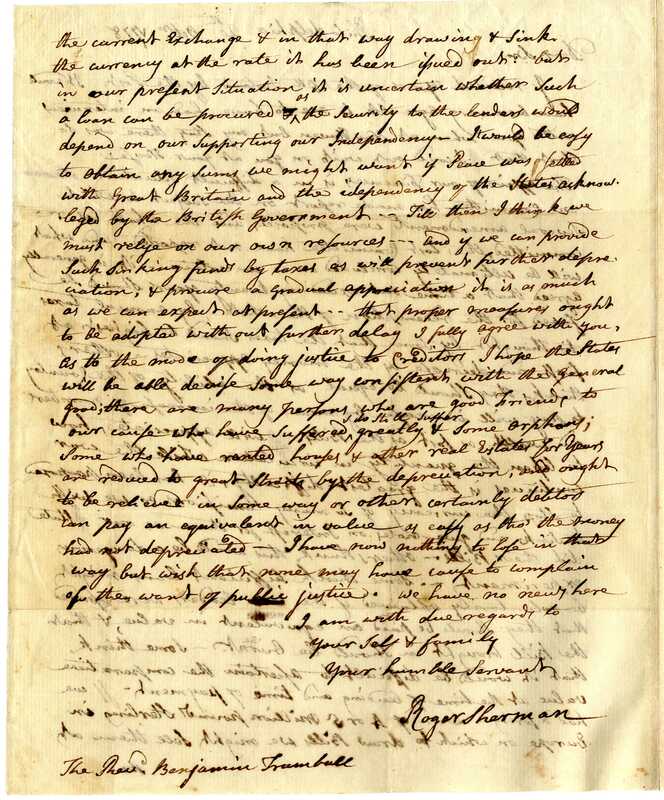 As the framer of the Virginia Declaration of Rights, George Mason thought a Bill of Rights was an essential component and would not sign the Constitution if it was not included. Edmund Randolph argued that the Constitution was flawed and gave too much power to the one man in the executive office. All four men eventually supported ratification of the Constitution. 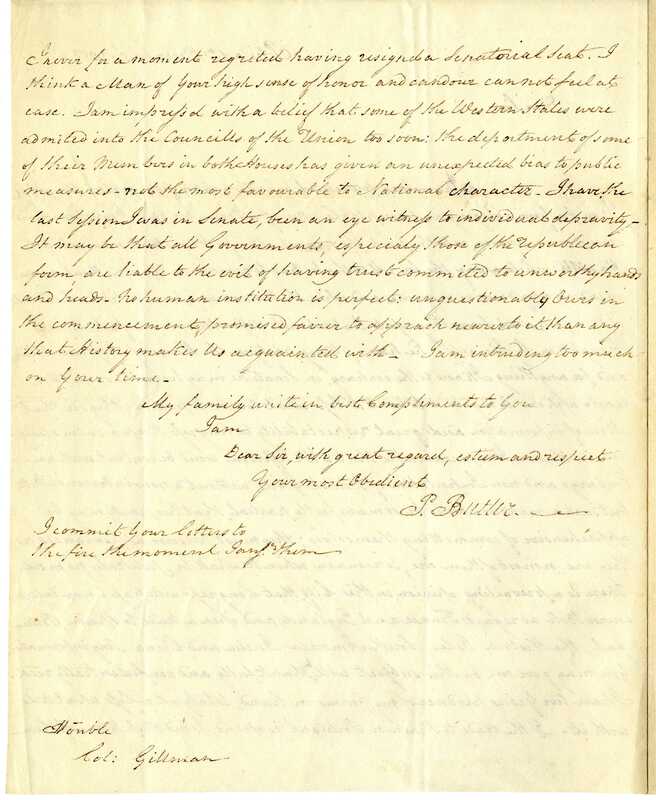 Circular issued by the Department of State and signed by James Madison regarding an amendment concerning the election of the President and Vice President of the United States, 1804. 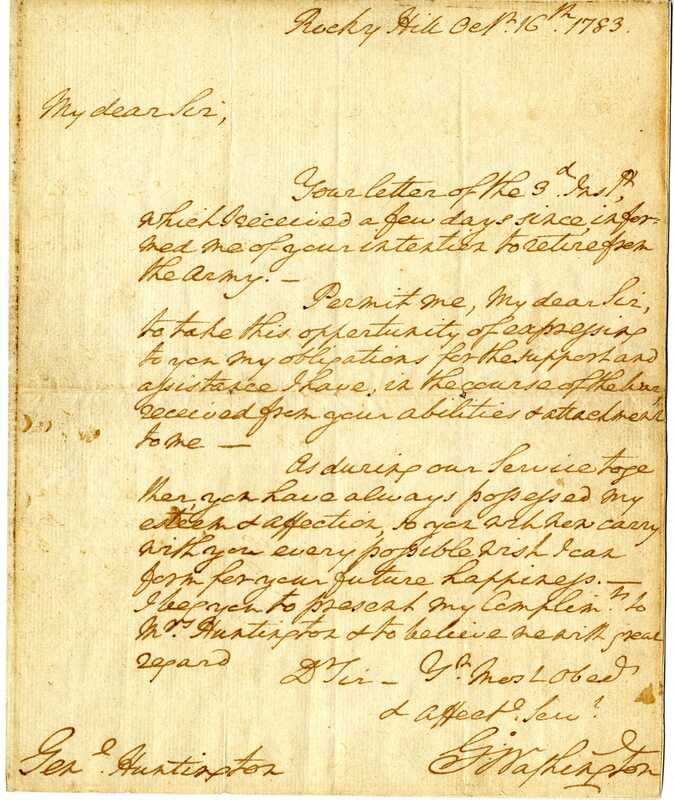 Letter from George Washington to General Huntington acknowledging the General’s intent to retire from the army and thanking him for his dedication and service, 1783. 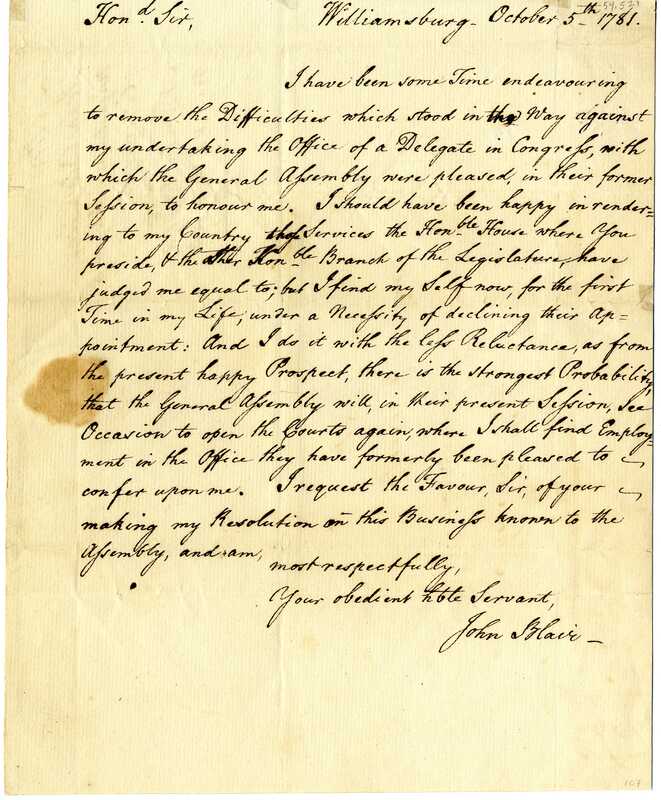 Letter from John Blair to Benjamin Harrison, Speaker of the House of Delegates, Virginia, concerning his desire to return to the Virginia court system instead of accepting a position as a congressional delegate, 1781. 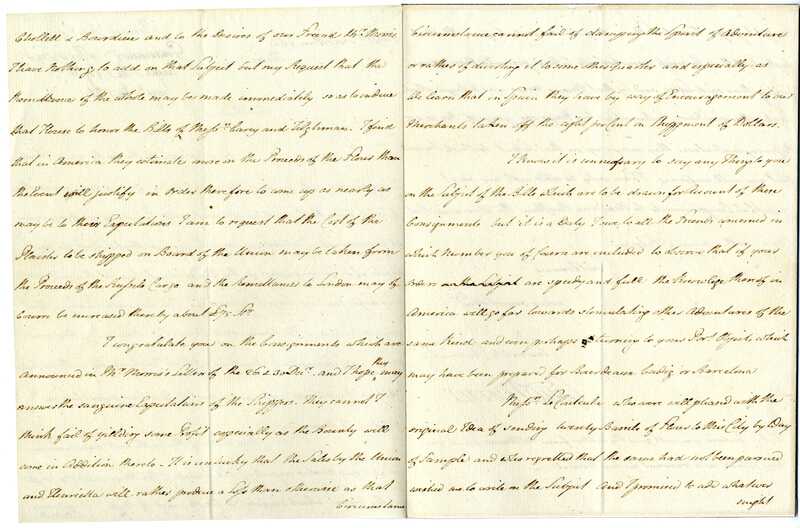 Rhode Island did not send delegates to Philadelphia and two of New York’s three delegates abandoned the Convention in July prompting George Washington to state that the Constitution was created by "eleven states, and Colonel Hamilton." 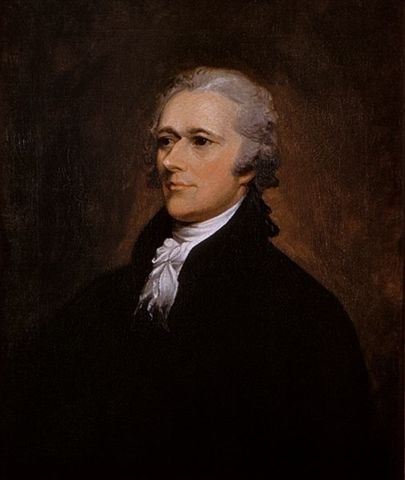 Although he proposed a plan during the Convention that so mimicked the British system of government that opponents accused him of supporting a monarchy for America, Alexander Hamilton was strongly in favor of the Constitution. Originally trained as a lawyer, Hamilton’s extensive service to his country included serving as General Washington’s aide-de-camp during the Revolutionary War. He was also a member of the Continental Congress and founder of the Bank of New York. In favor of a strong national government and no friend of states’ rights, Hamilton led the Annapolis Convention which was convened to “remedy defects of the federal government” caused in part by the inadequate Articles of Confederation. After deliberating for four days, the delegates called for a constitutional convention. Hamilton was an active participant in Philadelphia. He co-authored the Federalist Papers which are still the preeminent source for Constitutional interpretation. Hamilton also served on the Committee of Style and Arrangement. As the nation’s first Secretary of the Treasury, he was the architect of the country’s first financial system which included the establishment of a national bank. He was founder of the Federalist Party and instrumental in assisting with the management of American foreign relations. Hamilton was killed in a duel by political enemy Aaron Burr in 1804. The two New York delegates who did not sign the Constitution were John Ten Eyck Lansing, Jr. and Robert Yates. Lansing was an attorney who left the Convention because he believed he was authorized only to participate in amending the Articles of Confederation. On December 12, 1829, when he was 75 years old, Lansing left his Manhattan hotel to mail a letter and was never seen again. The source of his disappearance remains a mystery. Yates was a judge and political writer who often wrote under pseudonyms. Known for his Anti-Federalist opinions, he is the presumed author of a number of essays assailing the Constitution. 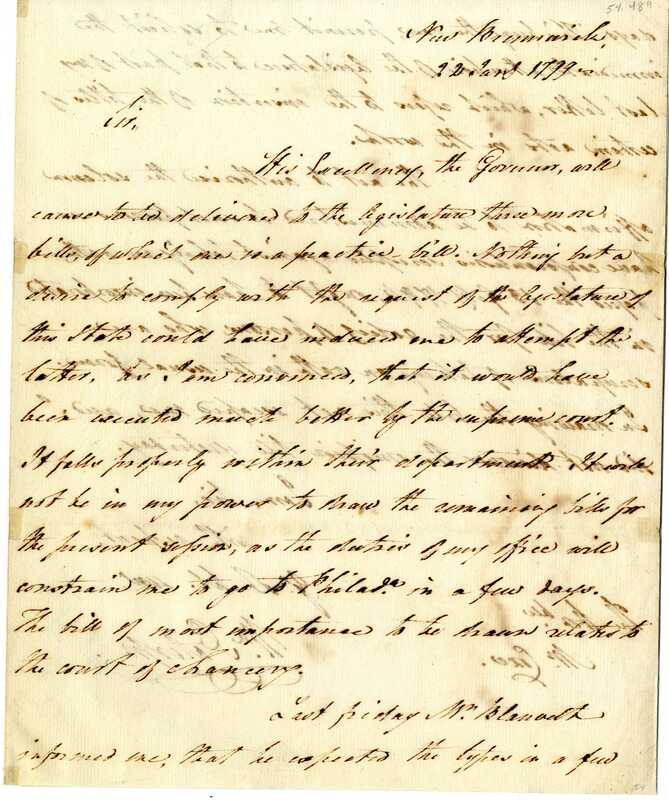 Letter to James Watson regarding The Manufacturing Society and Mr. Samuel Ogden as superintendent, signed by Alexander Hamilton, 1792. Life in the sparsely populated and rural state of North Carolina was characterized by the divide between the eastern low country and the western piedmont country. The members of the planter class of the eastern coastal area, who grew tobacco and rice, originated primarily from England and the Scottish Highlands. The western part of the state was populated by non-slave owning yeomen farmers who were of Scots-Irish descent. These factors affected the state economically, politically, and socially. During the American Revolution the plantation class remained loyal to the British crown causing conflict with the majority of the state population who worked toward American independence. William Blount was born in Windsor, North Carolina in 1749. He served as a paymaster in the North Carolina militia during the American Revolution. 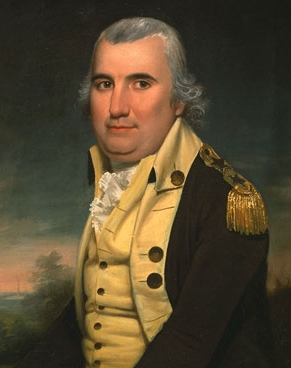 Blount dedicated his life to public office by serving in the North Carolina legislature and representing his state at the Continental Congress throughout the 1780s. At age 38 he served as a delegate to the Constitutional Convention. 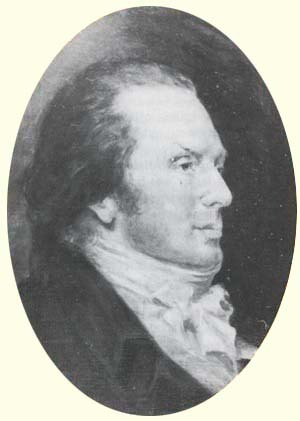 Blount missed more than a month of the Convention because he was representing his state at the Continental Congress during the same time period. He signed the Constitution reluctantly. 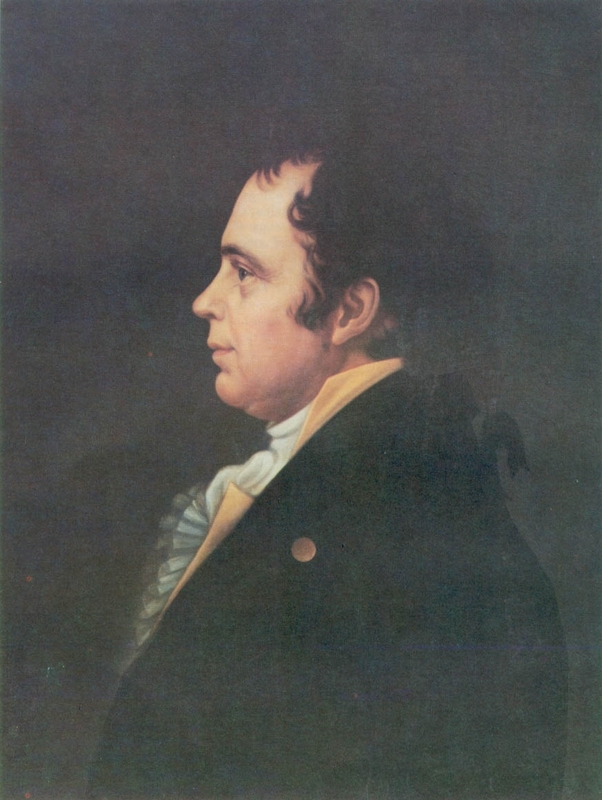 Richard Dobbs Spaight, Sr. was born in New Bern in 1758; however, he spent much of his youth attending school in Ireland and Scotland, returning to North Carolina in 1778. Soon after he was commissioned in the North Carolina militia and elected to the North Carolina legislature. A few years later he left the military to focus on his political career. At age 29 he represented his state at the Constitutional Convention where he attended every session. He worked to helped ratify the Constitution in his state. In 1802 Spaight was mortally wounded in a duel with rival politician John Stanly who dishonored him while competing for a seat in the House of Representatives. 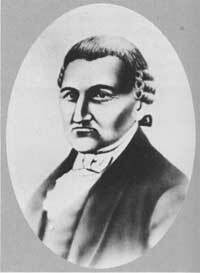 Born in West Norringham, Pennsylvania in 1735, Hugh Williamson’s occupations included studying to become a Presbyterian minister, practicing medicine, and examining scientific matters. In 1773 he was preparing to sail from Boston to London when he witnessed the Boston Tea Party. While in London he reported the news to the Privy Council and warned it that the colonies would rebel if Britain did not revise its policies. 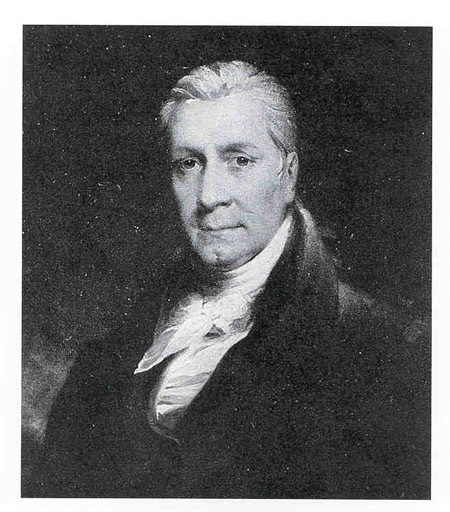 In 1775 Williamson authored a pamphlet titled “The Pleas of the Colonies” in order to gain support for the American colonies from English Whigs. 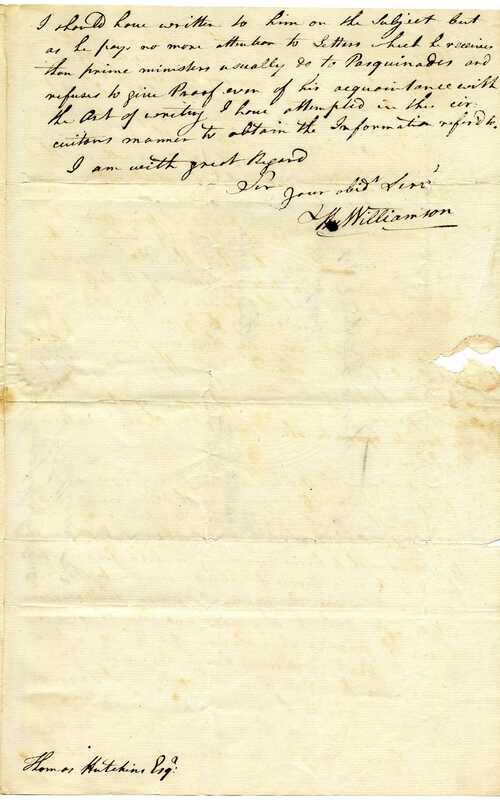 Williamson was in the Netherlands when he heard that the United States had declared independence. He sailed back to the states, settling in Edenton, North Carolina. He was appointed Physician and Surgeon General of the North Carolina troops. In 1782 Williamson was elected to the North Carolina state legislature and was appointed to serve in the Continental Congress. As a delegate to the Constitutional Convention, Williamson was an active debater and served on five committees. There were two delegates from North Carolina who did not sign the Constitution: William Richardson Davie and Alexander Martin. Davie was an early governor and a founder of the University of North Carolina. At the Constitutional Convention he favored a strong central government, counted slaves as a complete person during the representation debate, and voted in favor of the Great Compromise. Martin was a merchant and two-time governor of North Carolina. Of all the delegates from his state, Martin was the weakest Federalist. He did not take part in the proceedings and left the Convention in August. 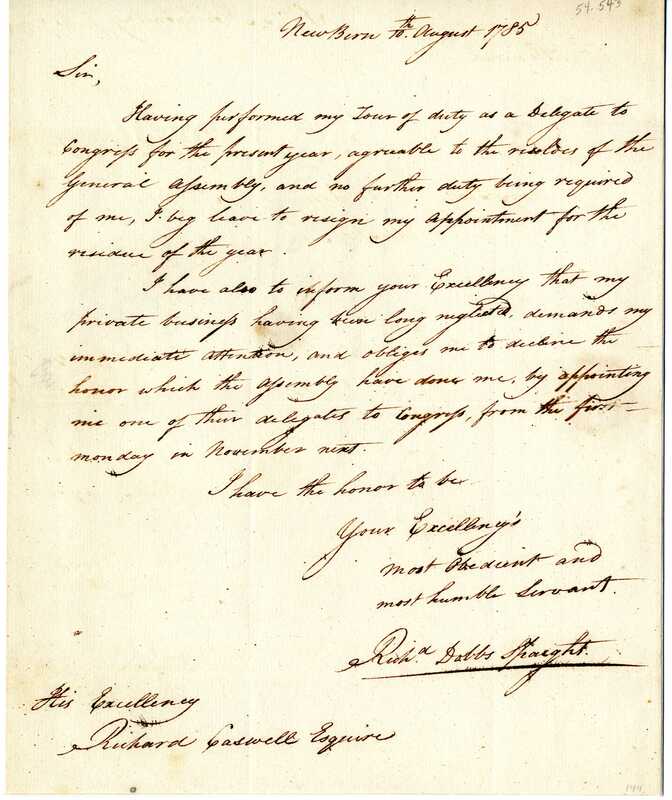 Letter from William Blount to Richard Caswell discussing business and financial matters, 1787. 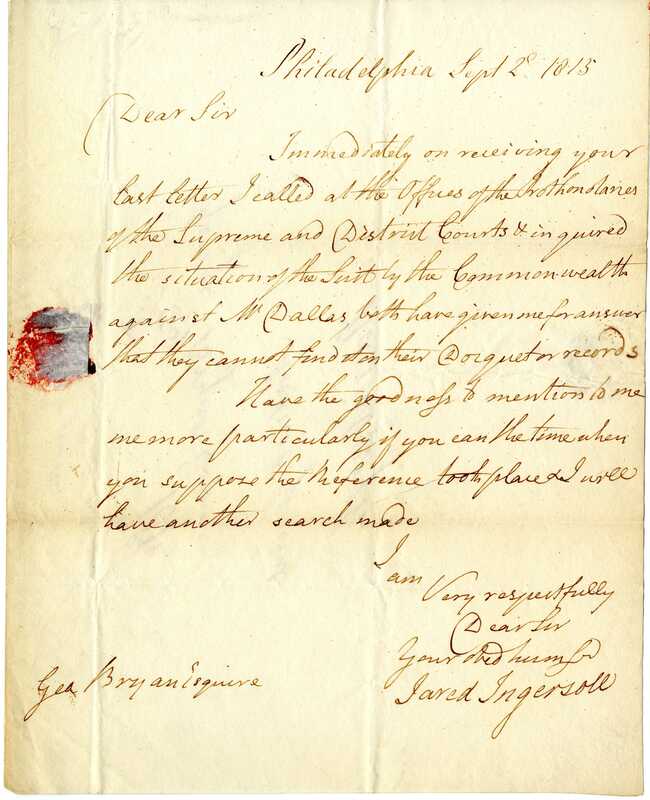 Letter from Richard Dobbs Spaight to Richard Caswell, Governor, concerning Spaight’s resignation from the Continental Congress, 1785. 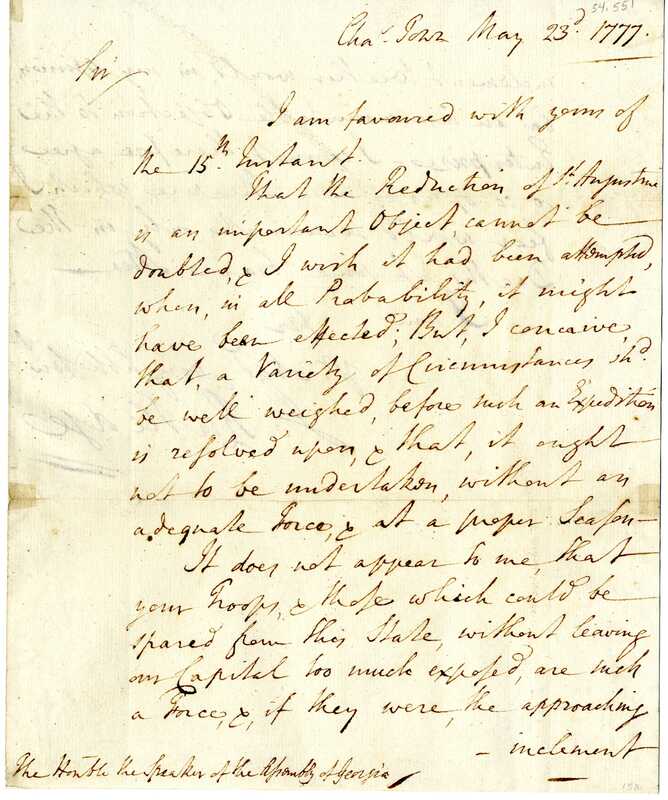 Letter from Hugh Williamson to Thomas Hutchins, 1784.